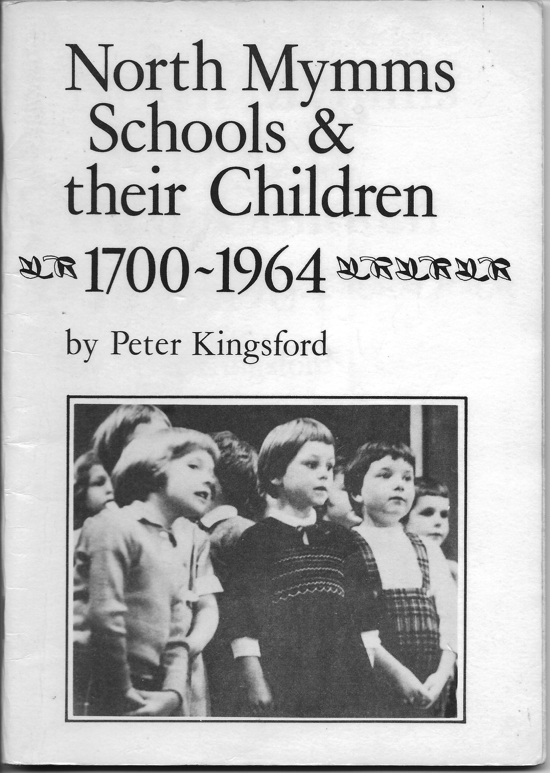 'North Mymms Schools & their Children', is the third in the series of books by the late Peter Kingsford following on from his first, 'A Modern History of Brookmans Park 1700-1950'. 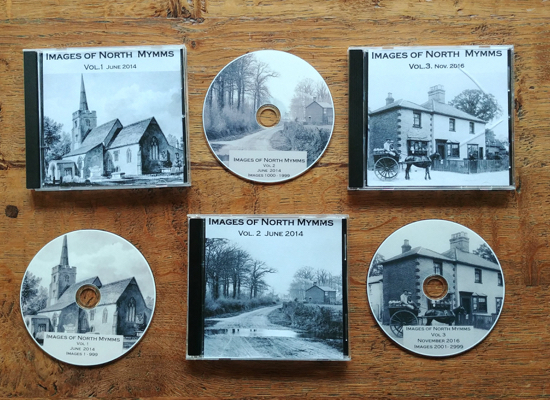 Peter's second book is 'North Mymms people in Victorian Times' and his fourth is 'Victorian Lives in North Mymms'. All have been reproduced in full on this site following permission from Peter and the now disbanded North Mymms Local History Society. The purpose of this short history is to show and explain how the education of the children of North Mymms parish has changed over two and a half centuries. The parish lies mostly between the A1000 and the A1(M) roads, four miles south of Hatfield, Hertfordshire. Early in the nineteenth century it had a population of about one thousand souls living on some 5000 acres. The parish was a group of settlements: the village of Welham Green, the street-like hamlets of Bell Bar and Water End, the outlying communities of Roestock and Little Heath which connected with Colney Heath and Potters Bar respectively and later, Brookmans Park when the railway served it. The economy and the social structure of the parish depended a great deal, in two ways, on the nearness to London. The main crop, of hay, went to London and the return journeys brought the London dung for the fields. The convenient distance from the City also meant that, from the middle ages onwards, wealthy merchants settled in the parish as landowners, exercising patronage and giving employment. Agriculture was the chief livelihood and most of the wage earners were farm labourers. Their children and those of the artisans, gardeners, game-keepers and all the other ranks are the main subject of this history of the schools of the parish. The welcome given to 'A Modem History of Brookmans Park' (1983) and to 'North Mymms People in Victorian Times' (1986) has encouraged the author to offer this publication. The story could not, however, have been written without the research, which has been freely drawn on, done by Marian Benton, Lilian Caras, Bill Killick and Jenny Rackstraw. For the loan of documents and the gift of information grateful thanks are given to Mr D N Cheethain of Claytons, St Albans, the County Archivist of Hertfordshire and his staff, the Education Officer of the Mid Herts Division, Mr J P Fryer of Little Heath County Primary School, The National Society for Promoting Religious Education, North Mymms St Maw’s Church of England JMI School, The Society for Promoting Christian Knowledge, and last, but no means least, to North Mymms - Parish and People by Dorothy Colville. For the illustrations the author is indebted to R G Colville, C R Hills and Bill Killick. (Editor's Note: Illustrations yet to be added). I wish to thank also R G Colville and Lionel Munby, chairman of the Hertfordshire Local History Council, for reading the typescript. Any errors are all my own. 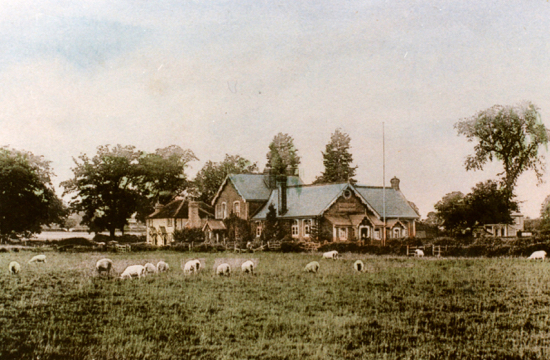 There have been schools in the parish of North Mymms for at least 275 years. Few things can have been more important in the history of a parish than its schools. Their effect on thousands of boys and girls was surely incalculable. Granted that the years of schooling were short for all of the children for most of that time, their influence on thought and behaviour must have been a formative one. 1710 Northmymms Hertfordshire. Twenty-four Pounds per annum subscribed for a School for 30 Boys and a Master chosen. 1711 A School for 14 B. cloathed, and put out Apprentice when fit. 12 Girls kept at School at the Expense of a young Gentlewoman. The faculty was granted to the vicar, John Alkin. A few years later, in 1724, the school had twenty-six scholars. Readers who go to North Mymms church may be able to locate the position of this combined school room and vestry. Its remaining stones may be seen embedded in the flint wall adjoining the porch. Something about this school may be inferred from its governing body, the Society for Promoting Christian Knowledge, founded in 1698. The Society’s teachers were required to be members of the Church of England and "to be of meek temper and humble behaviour; to have good government of themselves; and to keep good order". In the country side they were sometimes drawn from the poor of the village. "The parish clerk, the village dame, the religious poor woman, the private venture schoolmaster were retained by the patrons of the new schools, to teach the catechism, reading, and sometimes writing … free, gratis and for nothing." The North Mymms teacher may have been any one of those. Later on a wider field of recruitment seems to have developed. When the churchwardens advertised for a schoolmaster in 1769 they received several applications by post. Earlier in that century the SPCK had thirty schools in Hertfordshire and hundreds throughout England, usually maintained by subscriptions from the gentry. Some of the schools were endowed specifically for teaching religion and the three Rs to the children of the poor. This probably saved them from the farmers who generally opposed all such instruction because of its interference with their supply of child labour. They "denounced the folly of instructing country lads and lasses in the ‘theoretic parts’ of reading and writing". These are to be accounted vagrants, all patent gatherers or gatherers of alms under false pretences of loss by fire; collectors for prisons, fencers and bearwards; players of interludes, minstrels, jugglers, gypsies, pretenders to physiognomy or palmistrv, fortune tellers, persons that play at unlawful games or do run away from their wives and families; as also petty chapmen or pedlers without licence, and wanderers lodging in barns and outhouses, or pretending to be soldiers, mariners or seafaring men; persons living idly and refusing to work for common wages or ranging about from place to place. The Anglican Catechism was the first textbook for the infants who were learning to read, followed by the Book of Common Prayer, the New Testament and finally the Old Testament. There was much learning by heart, sometimes whole chapters of the Bible. Such a method, resulting in correct pronunciation rather than understanding, was self-defeating. Writing was taught only when the children could read competently, and more often to boys than girls. Arithmetic, consisting of the first four rules, was reached only when reading and writing were "perfected", and so, seldom. There was criticism of this "literary curriculum" as not likely to develop habits of industry in children destined to become labourers or domestic servants. Accordingly, needlework, knitting, spinning, gardening and even ploughing took up much of the time in school. That was the general run. The charity school in North Mymms is not likely to have been very different from it. On Sundays the boys were probably put in the church gallery. In North Mymms this was built in about 1730 because "so great a part of the church … is now taken up by the Pews appropriated to the Gentry". They could be kept under control there, as Joseph Poorgrass recalled in Far From the Madding Crowd ‘and he would box the charity boys’ ears if they laughed in church, till they could hardly stand upright and do other deeds of piety natural to the saintly inclined." 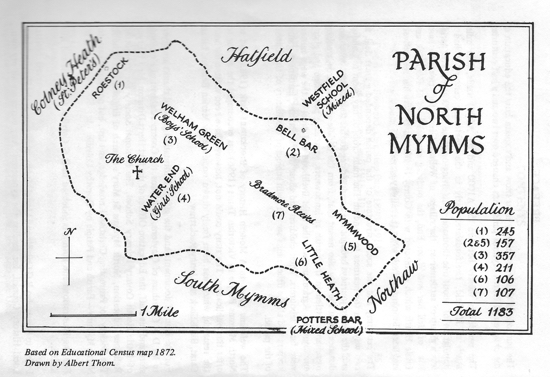 There is no trace of the North Mymms School after 1770. It seems likely that it disappeared since there was a general decline in SPCK schools. Forty-seven years later (1817) there were no parochial schools in the parish, according to Joseph Sabine, churchwarden, giving evidence to a select committee of the House of Commons. This is con firmed by a report a year later from the vicar to another Parliamentary committee that "A National School for boys is much wanted, as the poor are both ignorant and irreligious." However, charity had persisted, for the Rev William Jackson told the committee that there was in fact "A school lately established by an individual at his own expense, in which 42 girls are taught; and a Sunday school, containing 30 boys, supported by subscription." This was in a population of about one thousand. Girls could be more easily spared than boys from contributing to the family income. Some explanation of the term National, used above, may be given here. As the industrial revolution developed and a new class, the working class, emerged from it, educationists saw that schools of the proper kind would be the surest way of preserving traditional values in society. Soon after William Lancaster, a Quaker, had started his monitorial system of teaching, the British and Foreign School Society was founded in 1808. Its object was to provide non-sectarian education. It was in response to this alarming nonconformist initiative that the Anglican Church established, in 1811, the National Society for Promoting the Education of the Poor in the Principles of the Established Church. This was the beginning of a rivalry, which bedevilled progress in education for the rest of the century. In North Mymms, in the virtual absence of nonconformists, it was a National school which was "much wanted". One was not long in coming, Though it was only for girls. In 1824 Brookmans School affiliated to the National Society. This school may have been the same one reported by the Rev Jackson in 1818 for it was Cecilia Gaussen, widow of Samuel Robert Gaussen the Squire of Brookmans, who signed the application to the Society. Fifty to fifty five girls attended daily and on Sundays and about twenty years later the attendance had risen to sixty. 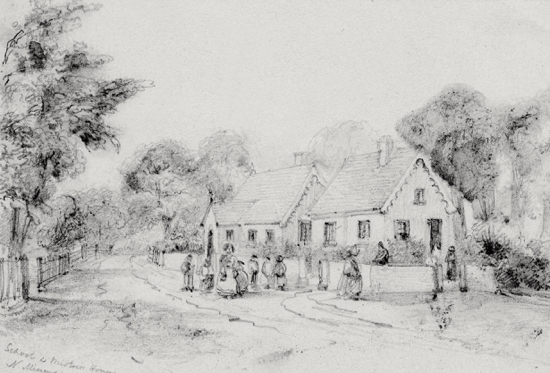 The mistress in 1841, Mary May, a spinster of thirty five resided in the "School House, Brookmans". This was near Moffats Farm which belonged to R W Gaussen. It seems likely that the school was in the former barn, now St Michael’s and All Angels’ chapel, since National schools of that period were often held in barns. There was also in existence, in 1831, a small school which, a Government Return recorded "contains 14 children of both sexes, and is partly supported by endowment, for which six are instructed, the remainder are paid for by their parents." A further step was taken when the parish workhouse building in Workhouse Lane, Welham Green, became vacant. Consequent upon the Poor Law Amendment Act of 1834 North Mymms workhouse was closed in 1835, the furniture sold and the twelve inmates, young, old and infirm, shipped off to Hatfield Union Workhouse. In the same year their place was taken by schoolboys. It was this school which became the parish’s National School for Boys, "much wanted" seventeen years earlier on. The vicar, the Rev J H Sotheby, may have taken the initiative for he signed the application for the school to join the Society in 1837. Forty to fifty boys sat in the schoolroom on Sundays as well as weekdays. They were all ruled by one master, William George Goulburn. Born in 1800 in the City of London, he had lived in the East End, in Bethnal Green and Shadwell, before moving to the very different, little world of Welham Green. Goulburn lived in the school house with its yard and garden at Barefords, owned by the parish, with his wife Ann and two sons and two daughters, all born in London. He was to stay in the village for another fifty years, doubling as parish clerk with schoolmaster and, after retirement, as postmaster and rate collector. The National Society, to which both schools were affiliated, had grown and become influential, supported as it was by bishops and archbishops. The first Government grant of £20,000 in 1833, shared between the National Society and its nonconformist rival, the British & Foreign Society, increased to £30,000 by 1839. The grant was towards the building of schools; neither of the North Mymms schools appear to have received any of it. Grants to schools were conditional on the monitorial method of teaching being used. Under this system the master gave the monitors simple instructions which they then passed on to groups of pupils. The principle of division of labour had spread from the factories to the schools. Although North Mymms had no grants, it is likely that the monitorial system was adopted in its schools since it was in general use. It was cheap, and in North Mymms there was only one teacher to each school. In the 1840s there were considerable stirrings in education. An enormous investment in railways and the increasing development of manufacture, making Britain the workshop of the world, were taking place. It was an age of rapid economic change, like our own times; then, however, policy was concerned with improving and extending education. Two events were significant. The Battersea Normal School of 1840 was followed by the pupil teacher system in 1846. The Privy Council had been obliged to form an Education Committee to manage the Education Vote which, by 1847, had risen to £100,000, five times the original figure. The monitorial method of teaching had been found inadequate; "monitorial humbug" the secretary of the Committee called it. Convinced that more teachers had to be found, he started the Battersea training college of which the Prince Consort became patron. He soon followed this with the new pupil teacher scheme which was to be the main source of teachers for the rest of the century. Such was the national background of the initiative in North Mymms by Miss Caroline Lydia Casamajor in 1847 when she built and endowed the school for girls and infants at Water End. Her will directed that the school should be in two parts, one for not more than fifty girls between six and fourteen years, The other for infants with a maximum number of fifty boys and girls under six years. She bequeathed £3000 in 3% bank annuities for the school’s maintenance, and stipulated how it was to be spent. Four ninths of the income was to pay the salary of the mistress of the girls’ school, two ninths was for the infants’ mistress, two ninths for clothing, books, stationery, tape, needles, thread etc. and one ninth towards the maintenance of the school house. The income of £90 a year divided conveniently into ninths. "And I hereby expressly direct that the said school in which I take so keen an interest shall be conducted and established and carried on and the children thereof educated and instructed according to the principles of the Church of England and for the benefit of children of the poor of the parish of North Mymms." It seems likely that the Water End school replaced the Brookmans school mentioned in chapter 1. Caroline Casamajor was connected by marriage with Cecilia Gaussen. The families lived near each other, no doubt attended the same church and were in the same social circle. Miss Casamajor was the daughter of the Casamajor whose farm at Potterells was vividly described by Arthur Young. By 1847 she had moved to Moffats where, a lady of independent means, she lived alone, attended by five servants; footman George Farrow, page William Goodson, cook Mary Syrett, lady’s maid Lydia Langley and housemaid Elizabeth Farrow. This girls’ and infants’ school seems to have made a slow start. Although a schoolmistress’s house was built in 1850 by Lady Greville of North Mymms Place, there was only one mistress there a year later. She was a mere girl of nineteen, Magdalene White from Nottingham. Perhaps she was the infants’ mistress provided for in the will. It is difficult to suppose that she could have taught the girls as well, especially as by 1854 there were about forty girls in the school. In the boys’ school at Welham Green about fifty boys assembled under William Goulburn. There was plenty of leeway to be made up for both boys and girls, but more for the boys than for the girls. The poor, described in 1818 as "both ignorant and irreligious" were still, in 1850, ignorant of their letters, even if better instructed. Illiteracy was common. Nearly 150 years after the first school was founded in the parish, half of the bridegrooms could not sign theft names in the marriage register. The brides could do better; only a third of them had to put their mark instead of a signature. One reason for this is clear. Few children stayed at school after the age of twelve. Child labour was still a reality. In the parish there were seventeen children under twelve, most of them boys, mainly working in the fields for a wage. Their earnings added to the meagre wages of their fathers, themselves usually farm labourers. Another seventeen child workers were aged up to fourteen. As well as these full time juvenile wage earners there were many more part timers who were kept away from school when the farmers’ demand for labour was heavy. The teachers at both schools seem to have been without assistance for some years for their large classes of all ages and all abilities. The pupil teacher system of 1846 spread only slowly to the village schools. The Water End school had a pupil teacher by 1864 as well as two mistresses, Caroline Read and Elisabeth Trickett, not to mention two youthful monitresses. But at the boys’ school one does not appear until 1871. No doubt the fact that the girls’ school had its assured annual income from the endowment whereas the boys’ had none and was all the more dependent on subscriptions from the gentry, had a bearing on the staffing. "Even if it were possible, I doubt whether it would be desirable, with a view to the real interests of the peasant boy, to keep him at school till he was 14 or 15 years of age. But it is not possible. We must make up our minds to see the last of him, so far as the day school is concerned, at 10 or 11. We must frame our system of education upon this hypothesis; I venture to maintain that it is quite possible to teach a child soundly and thoroughly, in a way that he shall not forget it, all that is necessary for him to possess in the shape of intellectual attainment, by the time that he is 10 years old." "a large proportion of the children are not satisfactorily taught that which they come to school to learn ... Though children leave school at a very early age, and attend with little regularity, they do attend long enough to afford an opportunity of teaching them to rend, write and cypher. A Large proportion of them, however in some districts do not learn even to read; at least their power of rending is so slight, so little connected with any intelligent perception of its importance, and so much of mere mechanical routine, as to be of little value to them in after-life, and to be frequently forgotten as soon as the school is left. The children do not generally obtain the mastery over elementary subjects which the school ought to give. They neither read well nor write well. They work sums, but they learn their arithmetic in such a way as to-be of little practical use in common life. Their religious instruction is unintelligent, and to a great extend confined to exercises of merely verbal memory ...". There is little reason to suppose that the North Mymms schools were an exception to this severe, if general, criticism. It is clear that many children in the parish described as "scholars" in the 1851 census either did not go to school or went irregularly. The number of children so described was 150, excluding those at Bell Bar who walked across the Great North Road and the fields to Westfield School in Grubbs Lane, outside the parish. However, according to Kelly’s directory the average number at the parish schools was 90, 50 boys and 40 girls. It is no wonder that illiteracy was so common. Change was imminent. 1863 was a year, which opened a new prospect for all schoolteachers, school managers and pupils for the rest of the century. On 1 August that year the Revised Code of Regulations for the administration of grants to schools came into force. The prospect was not wholly beneficial. The Code arose from the Newcastle Commission which stated: "Till something like a real examination is introduced into our day schools, good elementary teaching will never be given to half the children who attend them." "I cannot promise the House that this system will be an economical one and I cannot promise that it will be an efficient one, but I can promise that it shall be one or the other. If it is not cheap it shall be efficient; if it is not efficient it shall be cheap." This aim was to be achieved by making the grants to schools depend strictly on attendance and on examination passes in reading, writing and arithmetic in six standards from age six to eleven. Until then the grants had been based simply on the amounts raised by local voluntary efforts. The intention now was to economise at a time when educational expenditure was rising, on top of the cost of the Crimean War. This intention was realised. The Royal Commission had recommended "the extension of sound and cheap education". Some effects of the Revised Code may be seen in the Welham Green and Water End Schools. The code altered radically the way in which the schools were financed and maintained. More important were the changes it brought about in what was taught and how it was taught. To turn to money first, the capitation grants were very small to begin with, only £3 4s 0d in 1864, and that was only at the girls’ school. Since grants were made only for trained, certificated teachers, it seems likely that the master at the boys’ school, John Gray, was not qualified. Seven years later, however, the grants had shot up under the new system to £45 8s 0d for the boys and £36 17s 0d for the girls. By that time the schoolmaster, George Foster, was properly certificated. The school managers were, therefore, faced with a complete change in the sources of money for the schools. The new grants rose to 35% of total income during those seven years in the boys’ school, and to 24% in the girls’. There were two other main sources of income. The school pence, fees paid by parents, were graduated according to social status: labourers 2d per week, gardeners, gamekeepers and artisans 3d, all others 6d. This income was largely unaffected by the grants. The other source of money, a much more important one, subscriptions from the gentry, was much reduced. In the 1860s these amounts were practically the whole income of the boys’ school; in the 1870s they were only about half of it. The names of the vicar and of the landowners, Gaussen and Kemble and the banker Cotton Curtis, figure largely and regularly among the subscribers. The case of the girls’ school was different because of its endowment bringing in £90 a year but its contributions from the gentry also became less important, even to vanishing point. Thus as the money from the central government increased, so the voluntary subscriptions were less significant, though still required for the boys. The link between the gentry and the schools became looser, or at least made fewer demands on their purses, and no doubt this aspect was appreciated by them. Education depends on the resources made available to it and the uses to which they are put. In the 1860s in North Mymms the resources consisted of teachers, buildings and their maintenance, heating, lighting and cleaning, books and apparatus, prizes and rewards, and materials for the girls’ school. These last were, at the end of the decade in 1870, print for frocks and flannel for petticoats amounting to £10 4s 7d. Books and apparatus were less important and cost less at £6 l0s 7d; for the boys even less at £3 1s 5d. The largest expenditure was then, as now, on teachers’ pay, low as it was. Thus the master’s salary amounted to £76.16s.4d. including allowance for "apartments", plus £13.2s.6d. for pupil teachers. The mistress got less - £50, but she had an assistant at £25 and a pupil teacher at £10 .5s. 0d. All these items, with others, came to a total expenditure of £111.7s.l0d. on the boys’ schooling, compared with £189.0s.3d. on the girls and infants. That particular year 1870, the girls had new desks and seats (the school was twenty three years old). There was no option, they were required by H M Inspector. Without them, there was the risk of, in the vicar’s words "having a School Board inflicted on the parish and a Rate Supported School." School Boards were to be set up under the 1870 Education Act where there was inadequate provision. The vicar, the Rev Arthur Latter, put his hand in his pocket, as so often, and paid for the furniture. Just as Lowe’s Revised Code changed the resources of schools, so it heavily influenced the way those resources were used. The two aspects were linked in as much as the grants depended on examination results and attendance. The Church opposed the Code because the emphasis on the three Rs would be a danger to religious instruction. In village schools the new system was grafted on to the old one in which religious knowledge took pre-eminence. Something of this situation may be seen from the logbooks of the boys’ school at Welham Green. The first year for which they survive is 1868/9. The new master was George Foster from Kent, a young man of twenty-eight, fully trained and "certificated first class". He lived in the schoolhouse with his wife Jemima, baby daughter and son, and with him his brother in law, master bootmaker by trade. His meagre salary was supplemented by a fee as church organist. He had, as assistant, a pupil teacher, a lad of 14 called George Bligh, son of the farm bailiff at Travellers Farm. Some help also came from the vicar who taught his own special subject and who some times stood in for absent teachers. By this time the Revised Code had operated for five years. The three Rs were prominent in the timetable. Arithmetic consisted of the three rules, together with pounds, shillings and pence and weights and measures. Writing was usually done on slates, though occasionally on paper. Some poetry came into the reading. But that was by no means all. Every day, after prayers, there was religious instruction based on the Bible and the Prayer Book. Scripture also permeated other subjects, reading and writing. That much was useful or considered proper, but there were extras, some English history and geography, especially of the Holy Land. George Foster was quick off the mark, for these two subjects had been added to the three examinable subjects only in the previous year. At the end of that year thirty-eight boys were presented for examination. Thirty-four passed in reading, thirty in writing and twenty-six in arithmetic, at six different standards. Her Majesty’s Inspector commented: "Instruction very fair, but not yet up to standard, too much noise and talking, more discipline needed." 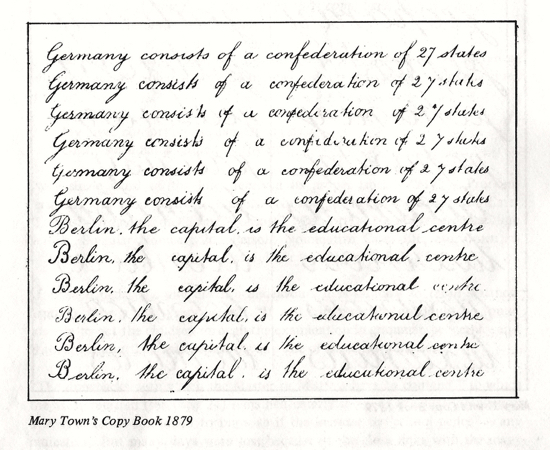 In the next year, 1869/ 70, some advance was made, in arithmetic fractions were introduced; copybooks were used in the writing lessons; geography became more liberal with lessons on Europe, Asia and Africa. The number of boys entering the examinations increased to forty seven, with forty three passing in reading, thirty eight in writing and forty in arithmetic. The vicar was so pleased that he gave a book to each successful boy. This time the HMI reported, "School in very fair order, and attainments good." As the average attendance was probably about sixty, the Inspector’s comment may also be considered very fair. Attendance was, inevitably, highly irregular. Wet weather, frost and snow, high winds and floods took a higher toll than today. Boys of school age worked for the farmers whenever work was available, haymaking and potato picking; and for their families at gleaning, acorn picking and wood gathering. The gentry’s sport also made demands on them; beating for Gaussen’s shoots at Brookmans lasted several days. A note of exasperation may be seen in the master’s entry in the school logbook for 25 November 1869. "Attendance still low - more shooting - gave the 1st Class a Lesson on the Ark in the Land of the Philistines ..."
"In a country where everyone is prone to rely too much on mechanical processes and too little on intelligence, a change in the Education Department’s regulations, which by making two-thirds of the Government pant depend upon a mechanical examination, inevitably gives a mechanical turn to the school teaching, a mechanical turn to the inspection, is and must be trying to the intellectual life of a school ..."
"In the game of mechanical contrivances the teacher will in the end beat us; it is now found possible, by ingenious preparation, to get children through the Revised Code examination in reading, writing and ciphering ..."
It may be that the Welham Green school escaped from the harmful influence of the new regulations, but it hardly seems likely. "Our night schools have been carried on very satisfactorily through the winter months. They were closed for this season on Tuesday, the 14th March. All the lads who had attended them met to partake of tea, etc, etc, at the Waterend Schools. There were sixty four present. Prizes were given for the Welham Green Night School to the following lads: for good conduct and regular attendance, to James Hipgrave, Henry Bodger and Samuel Pollard; for arithmetic, to Thomas Massey, Alfred Massey, Richard Chuck, Alfred Hipgrave, and W Jennings; for writing, to S Burr and James Hawkins. For the Roestock Night School, to the following lads: for good conduct and regular attendance, to George Frost; John Hart and George Field; for reading, to Thomas Taylor, James Sibley, Thomas Kenny, and Mark Pugh; and for writing to Joseph Hipgrave. After the distribution of the prizes, a magic lantern was exhibited to the lads, who seemed thoroughly to enjoy the evening’s entertainment. Their behaviour was all that could be wished. The prizes given were copies of "Good Words", ‘The Leisure Hour", ‘The Sunday at Home", ‘PIeasant, Hours", "The Parish Magazine", etc." One can see at least one name there, which survives in the parish today. Clearly there was in the night school an unsatisfied thirst for knowledge among the boys. Among those who helped to quench it were John E Gray, former schoolmaster, and William Groom, bricklayer and parish clerk for the modest fee of £4.l0s.0d which included the use of rooms. By 1870 the night school also received a government grant, but it also depended heavily on the gentry’s subscriptions to which the vicar made the largest contribution. The chief influence on the schools in this period was what the vicar called a beneficent Act of Parliament. He wrote: - "It is intended to enforce on parents the duty of conferring on their children, that which they ought to be only too thankful to gain for them, the advantage of a good education; and it must be a thoughtless and cruel parent who, through negligence, fails to secure this boon for their child." The Elementary Education Act of 1870 was the product of twenty years’ discussion and controversy. It provided for school boards to be set up in those districts which were short of schools of the required standard, with the duty of "filling the gaps" which had been left by voluntary schools. The gaps were large; one and a half million children had not been reached. The boards would establish the necessary schools, to be financed by the rates. The author of the Act, W E Forster, Gladston’s Vice President of the Council, brother in law of Matthew Arnold, Quaker and Radical, had one great difficulty. This was to settle the issue of religious education, strongly contested between the established church and the nonconformists. His solution was a clause in the Bill that there was to be no denominational teaching in any school supported from the rates. It was therefore the aim of Church of England vicars like the Rev Latter to prevent North Mymms having a "Rate Supported School" controlled by a school board. The voluntary schools, such as those in North Mymms, were to receive a 50% grant but they had to put their house in order before the needs of each district were assessed. The arrival of the new desks at Water End has been mentioned in chapter 2. Thereafter the vicar, the Rev Latter repeatedly reminded his people of the new situation. He pointed out that the parents of children between five and thirteen who were not at school were liable to be summoned and fined and that this control was already in force under the London byelaws. Insisting that attendance must be more regular, he introduced two sanctions. The annual school treat, a great event, would be available only to children actually attending the day and Sunday schools. More rigorous was the fine of one halfpenny levied for, absence from either morning or afternoon school without leave. Encouragement, as well as deterrence, was given. At Water End there was a present of: - "Good Print sufficient to make a frock and a cape for each girl who had made more than 200 attendances." Forty-seven girls were eligible, including two who had never been absent, Emily Angell (appropriately named) and Alice Longstaff. The expectation was not very high, for 200 was far below the possible attendance. "There are, of course, difficulties in the way of unbroken attendance at School in Agricultural Districts, where wages are low, and children are soon able to earn a little, and where a certain kind of labour will only admit of a small sum being paid for it, such as bird-scaring, plough-driving, etc. On the one hand, the Farmer must not have the supply for his labour market lessened; and on the other, the Poor Man cannot afford to lose the little help that his boys of ten or eleven years are, at certain times of the year; able to gain for him." No boy between the age of six and twelve years will be employed by any Farmer, excepting in hay time and harvest, unless he be sent to him by the School Master. Parents who wish their boys to go out bird scaring, etc, to give notice to the School Master, who will keep a list of boys willing to be employed. No boy will be sent out for more than two days in any one week, and the remainder of the week he must be at School or his name will be passed over the next time boys are required. The Farmers, when in want of boys, will send a notice to the School Master, who will then arrange which boys are to go. Boys between the ages of 6 and 12 not attending School will not be employed by any of the Farmers. If parents can keep their children regularly at School, their children would make much greater progress than when they are taken away temporarily for field labour; but when the circumstances of the family make it a necessity for the children occasionally to help the earnings, it is believed the present plan will enable them to do so with the least injury to their future prospects. No boy will be sent out for labour from the Schools without the parents have signified their consent to the School Master. The vicar may have had foreknowledge of what was to come. Two years later he announced the official regulations, which were more stringent than those which he had agreed with the farmers. No children under eight were to be employed. Those of eight and nine years could be employed provided they attended school for 125 days a year; those of ten and eleven for only 75 days. Twelve years was the age for starting work without restriction. The corn and hay harvests were excepted from the regulations. In North Mymms there was, in fact, in 1871 only one working boy under twelve, Walter Briston of Bell Bar, son of a herdsman, widower with five children and a grandson to support. The fines for absence were duly levied, at least in the boys’ school, the offenders: - J Peck, E Groom, C Pollard, J Morris, F Burn, F Hill and A and J Kingham. In the last case their mother refused, or was unable, to pay. Per contra, rewards were given for regularity and good conduct and also to encourage parents to keep their children at school until thirteen years old. On Christmas morning 1871 Alice Dolley and Edward Blandford received one sovereign each, Emily Long and Henry Burgess half a sovereign each, and Hannah Burr and John Longstaff five shillings each. These were tempting rewards compared with the weekly wage of an agricultural labourer of about twelve shillings. Although irregular attendance was to remain a problem, North Mymms was in the clear officially concerning accommodation, at least in amount. 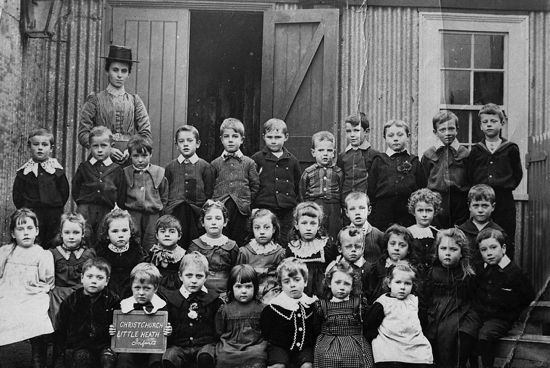 The census of education published in 1872 reported that 198 school places were needed and that there were sufficient places for all children who needed them. This survey included Little Heath and Westfield School, outside the parish. Education was not yet either compulsory or free. That was to come only gradually. Although Robert Lowe had admitted, "It will be absolutely necessary to compel our future masters to learn their letters", English government still clung to its subjects’ freedom to be unlettered. Only the school boards had been empowered to frame bylaws for compulsory attendance. But North Mymms had no school board and meanwhile the Rev Latter struggled for parental support. Relief came from Lord Sandon’s Act of 1876 under which the poor law guardians were to set up attendance committees where there was no school board. This Act now stated that it was the duty of the parent to see that his child was educated. It forbade employment under ten years. Children between ten and fourteen had to have had five years’ schooling and to have passed Standard IV before working. The Rev Latter welcomed this warmly. He distributed a summary to all parents, hoping "that we may never see the day when a Parishioner of North Mymms is summoned before a Magistrate for neglecting so obvious a duty." Further, there was a financial inducement; under certain stringent conditions the Government would pay the school fees for three years. The Hatfield Board of Guardians duly set up its school attendance committee and appointed as attendance officer H Dunham (also clerk to the guardians) whose duty it was to summon recalcitrant parents to be fined five shillings with costs. The vicar reminded everyone that "it will be to the Parents’ advantage to keep their children closely to school, if they wish to send them out to work soon." In fact the attendance required did not amount to much - 250 times a year. As each half day counted as one attendance, that meant 125 days in the year. The legal school leaving age was still ten years. By and large, the situation had become more favourable in the 1870s. The boys’ school seems to have taken advantage of it. The number presented for examination in the three Rs rose from forty five to sixty six, with a corresponding increase in the passes. The master, George Foster, was aided by his pupil teacher, Henry Burgess son of the woodcutter and beadle who lived in Churchyard Cottages, who had been promoted from monitor, and by a monitor to take his place. Before school assembly each day Foster had to teach the pupil teacher who was faced with his own topics of study - Macaulay’s speech on, appropriately, education and the state, and his essay on Hampden. The master extended the curriculum, so far as the revised code would permit. History, geography and grammar became examinable and grant earning. Thus in 1875 nine boys passed in history, ten in geography. The boys learned a good deal of poetry, Scott’s Lady of the Lake, Goldsmith’s The Deserted Village (a contrast with North Mymms). George Foster also taught music-and singing, the pupil teacher - nature study. "The Government Inspection is intended to apply the most rigid test to the efficiency of the School Teaching, and to ascertain how far the children in the School are being properly taught. Of course it cannot determine this with certainty; for the great hindrance to children at our National Schools being properly educated is - with many of them - the irregularity of their attendance; and with others. the early age at which they are removed from school. In the middle classes, the value of a good education is better known, and parents make every sacrifice to send their children, (often at great cost to themselves), to School; and keep them at School to a much greater age. There is little doubt, but that among the more respectable of those parents whose children are getting their education at our National Schools and it is certainly so at North Mymms, the value of a good education is beginning to be better understood; and a real effort is made, often at much personal inconvenience, and even present pecuniary loss, to ensure the regularity of their children's attendance at School, and to keep them at School until they are thirteen or fourteen. However, the Government Inspection is intended to show what the real state of each School is; and how far the instruction in it - notwithstanding the draw backs with which the Master or Mistress have to contend - has been successful. The Inspector is assisted by an Assistant-Inspector, who has been a National School master, and so, is thoroughly acquainted with the practical working of a School. The Assistant-Inspector pays his visit first; and examines; individually, each child in the School who has attended the requisite number of times, in reading, writing, and arithmetic; a piece of dictation is given to all children over a certain standard; and an examination has then to be passed in either some period of English history, or the Geography of some part of England or Europe, as the case may be. When this ordeal has been passed, the discipline and order of the School are examined into by the Inspector himself; and then the state of the School premises, their ventilation, warming, repairs, the efficiency of the School materials, such as desks, forms, books, etc, etc, are all passed in review. The inspector commented that the instruction was creditable, the work done on paper was up to standard, and the first year grammar was good, but he thought that the bearing of the boys would be improved by drill, and the "offices" (i.e. the lavatories) needed repair. The last item indicated an unwelcome addition to expenditure by the managers. Things were better next year, 1876 - 77. "The report", wrote the vicar, "is a very favourable one for both the Boys’ and the Girls’ Schools." But the boys had done the better, and the vicar was proud to announce that two of them, Frederick Nunn and Alfred Pollard, had gained Honour Certificates, signed by Lord Sandon himself. These could entitle them to free education for three years. All the Work was well done, commented the HMI, except the Third Standard, and the geography and grammar were very satisfactory. Some light on what that could mean is thrown by the kind of schoolwork which Mary Town was doing in Standard VI two years later. She was the eleven year old daughter of one of the railway signalmen who lived at Marshmoor with his wife, six children and mother in law. A little group of railwaymen were there, Henry Town, his fellow signalman and the railway gatekeeper. 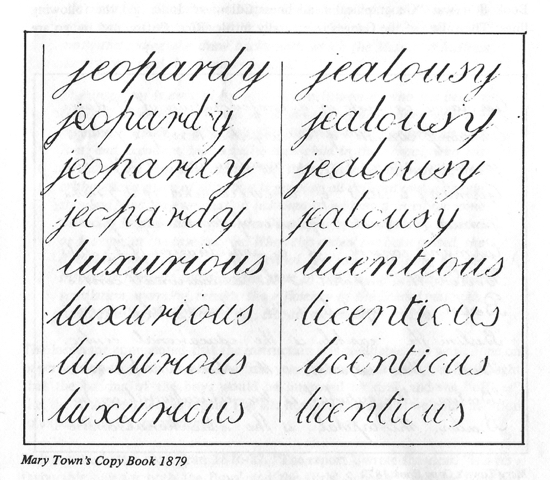 Mary Town worked at her copy books to practise her handwriting. On each page of the copy book were two lines of copperplate handwriting. She had to copy each line five times. The subject of the copperplate lines varied. In copy book 8, it was "Geographical head lines: Colonies." India had the following lines: The valley of the Ganges is naturally fertile. Rice, Cotton and indigo are exported from India. The soil of India yields large quantities of nitre. Allahabad is an important military depot. Lucknow is celebrated for its siege of 1857. Bombay possesses the finest harbour in India. Calcutta, the capital, is built on the Hooghley. Tigers and crocodiles live in the Sunderbunds. A British factory was established at Surat (1612). Similar gems of information in copperplate described the other colonies, Australia, Canada, etc. When she had copied each line five times she proceeded to copy books 9 and 10 on "Geographical head lines: Europe" and Copy Books 11 and 12 on "Geographical head lines: General". There she found such lines to copy as:The Baltic is a shallow inland sea with brackish water. Germany consists of a confederation of 27 states. The climate of Greece is mild and delightful. Moscow was burnt by the Russians in 1812. The teacher’s blue pencil varied from F to G.
"George the third King of England did not like to appear in public. He loved quietness. One day nearly all the inhabitants of a town assembled together to welcome the king. But instead of going that way he took another route, but as he was going that way he saw every house, every road and every lane deserted. He could see no one only a woman out in a field at work. He at once went over to her, and said, ‘My good woman how is it that you have not gone with your neighbours to see the king." Then the woman said "I have a large family sir and it takes all I can provide for them but I should have very much liked to have gone and seen him. Good King George, may GOD bless hint" Then the king took a note out of his pocket of the Bank of England, and gave it to the poor woman and said, You can tell your neighbours when they come back that you have seen the king, and they have not." Of life since has anchored by thy side,"
Every single word of the lines received its proper label: - "My": - Pronoun Personal; Common Gender; Singular Number; 1st Person; Possessive Case. "Loved" - Adjective qualifying "consort". "Consort" - Noun Proper; Masculine Gender, Singular Number; 2nd Person, Nominative Case. Etc, etc, down to - "has anchored" - Verb Intransitive; Indicative Mood. After such pedagogic and childish endeavours it is salutary to recall Matthew Arnold’s view a few years before: "It will with practice no doubt be found possible to get the children through the examination in grammar, geography and history, without their really knowing any one of these three matters:"
The drawbacks with which the Master or Mistress have to contend to which the vicar referred, remained chiefly those of irregular attendance. The attendance continued to improve if the increase in "school pence" is any indication. But many days were lost because of the close links with the many other church organisations for which the children were released. Of these, there were the choir outings, the flower show, the cottage garden show, cricket matches, the Band of Hope. Quite often epidemics of scarlet fever, whooping cough and "fever" (probably a euphemism for typhoid) closed the schools. In order to counteract these losses, labourers’ children were given rewards for attendance, through the kindness of a friend of the vicar. The boys - above the 4th standard, Alfred Pollard and Fred Tomlinson five shillings each, those below that standard, Alfred Longstaff, Herbert Towne, Robert Pollard and Emmanuel Chapman half a crown each; the girls above the 4th standard, Georgina Shelton and Eliza Knott five shillings each, those below it, Anne Day, Minnie Eaglestone, Jane Ray and Minnie Hill half a crown each. Emma Dickenson received a book instead of cash; as a farmer’s daughter she was precluded from the money reward. "Edward Groom did his drill in so careless and idle a manner he was given ten lines to do after school He made an impertinent gesture, so was given five more lines, which he refused to do. He had the cane, but still refused to do the lines. Groom therefore had no dinner, and when school re-opened, he and his brother Harry made an uproar. Harry was sent into the back room where he continued to shout and sing, so he was sent out from the school. After school Edward began to do his lines, and after a while the Master relented and remitted the remainder - ‘having shown him that there can only be one Master'"
At the end of the 1870s there was a sad tribute to the boys’ master. George Foster died at the age of thirty-nine, (after sixteen years at the school), leaving his widow with four children. Mrs Letitia Haines, who had recently taken over from Miss Wiseman at the girls’ school, organised a fund for a memorial stone and for the widow. The vicar, now the Rev G S Batty, wrote: "The names of the people who subscribed (by far the largest number being old scholars) shows how readily the opportunity was embraced of testifying to the love and esteem in which our late schoolmaster was held." There were 156 names on a subscription list which totalled £16 2s. 3d. Thirty subscribers gave one penny each, eighty nine gave in pennies, in addition to those - Gaussen of Brookmans, Cotton Curtis of Potterells, and the late vicar, who gave in pounds. Another sum of £8 l0s. 0d. was collected to enable Edith Foster, age six, to have a pension from the Schoolmasters’ Association. George Foster’s work was done; it had been marked by the biggest changes since the school began. He must have been delighted when his pupil teacher, Henry Burgess, completed his apprenticeship and was appointed as assistant master at another National Boys’ school. His school still depended heavily on the gentry. Out of a total income of £184 in 1877, voluntary subscriptions accounted for nearly £100, three quarters of which came from the gentry and the rest from farmers. The girls’ school, on the other hand, was still governed by, and benefited from, Miss Casamajor’s will. The 1880s open auspiciously for the children with an Education Bill introduced by A J Mundella, a member of Gladstone’s second government. It was only a matter of time before the village labourers would have the vote. They had to be compelled to "learn theft letters". The Bill enacted, for the first time, compulsory attendance everywhere. There were, as usual, various exemptions for children between ten and thirteen, and school fees continued, in particular at North Mymms. Admission was free only for the children of paupers, of whom there were two or three in the parish, whose fees were paid by the Hatfield Board of Guardians. While the Act improved the general outlook, the situation in the boys’ school was not so good. Following the death of George Foster two temporary masters followed one another in a single year. Next came Frederick Carter, also the church organist, who stayed for four years, then Edward Knowles for only two, William Lock for another two years, and stability was not reached until Benjamin Mallett took over in 1889 and remained for many years. Not surprisingly, HM Inspector’s report in 1886 was cool. The Rev Batty referred to what he called "the encouraging portions of the report": "the discipline is good and the general result was satisfactory. The work of the lower standards both in the elementary (that is the three Rs) and the class subjects (history, geography and grammar) was distinctly creditable." The importance of the elder children attending our National Schools gaining some knowledge of Cookery has received marked attention by the Education Department, and those who realise how much the attractions of a home depend on the way the daily food is prepared, will rejoice to hear that arrangements have been made to instruct the older scholars of our Girls’ School in this practical and necessary art. One of the rooms at the School Cottage, at Waterend, has been fitted with a range especially recommended by the National Training School of Cookery, at South Kensington, and supplied with the requisite materials. Classes will be held twice a week under the superintendence of our Assistant Mistress, Miss Turner, who has acquired a practical knowledge of the subject. It is hoped to arrange that the members of the Girls’ Friendly Society, resident in the parish, should also be admitted to the Classes. The food thus prepared may be purchased by the Scholars, at a moderate cost, either for taking home to their parents or for their own refreshment during the dinner hour, and will consist of soup, meat, vegetables, various kinds of puddings, tarts, cakes, etc. The friends of this movement are invited to assist the effort, by giving orders for beef tea, light puddings, or other nourishment suitable for invalids, or for any of the ordinary kinds of prepared food. Presents of vegetables etc., will also be gladly received at the School House, Waterend. The lessons went well for the inspector said that cookery and sewing were well taught. "Needlework", wrote the vicar, "is of equal if not more importance than cookery in the training of the rising generation." It was providential that the lady of North Mymms Place had given calico, flannel and wool for the girls’ industrious lingers. Mrs Haines originated prizes for needlework. 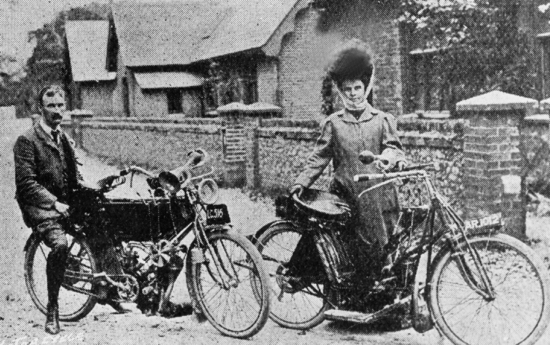 They were work boxes given by the gentry, Mrs Winch at North Mymms Place, Mrs Cotton Curtis, the banker’s wife, and Mrs Batty and the Misses Batty at the vicarage. In the vicar’s words, "they caused much delight to the prize-takers, and will no doubt form an encouragement to them to be practically handy with their needles in their several homes". The winning girls were Cecilia Arnold, Kate Banks, Martha Clarke, Alice Juby, Matilda Knott, Elizabeth Marsden, Catherine Parsons, and Frances Parsons. Both subjects were excellent training for domestic service. Also at Water End the infants performed even better. They obtained the highest possible merit grant of "excellent" in 1886, and received the same mark in the following year. "The object lessons are very good" reported the inspector. They were studies of all kinds of familiar and unfamiliar things such as - paper, sponge, cork and the squirrel, the goat, fish and even the giraffe and the crocodile. Ellen Turner must have been an excellent teacher. She was also a leading light in the Band of Hope and for her "warm and practical interest", was presented with a "handsome haberdashery box" subscribed for by sixty persons. The boys’ school seems to have had problems in the 1880s, probably because of the frequent change of master. No new subjects crept into the curriculum, firmly set as it was in the revised code. Discipline varied. The inspector’s report of "good" on the day of visits meant little. Punishable offences were numerous: rude replies, bad language, ill treatment of the girls, indecent graffitti in the closets, stealing, lying, breakages. The punishment was meant to suit the crime whether it was the cane, making an example before the whole school, lectures on sinfulness, loss of play time, or detention. Truancy, escape from the three Rs, was not uncommon. Twenty boys went into the fields close to the school to catch efts and were made to stay in; the fair at Barnet and a circus at Hatfield were irresistible attractions. Horatio Keep, Frederick Archer, John Keep and George Morris played truant in 1880 and were punished accordingly. Good conduct was rewarded and recorded by the master. "Fred Mayes found and brought to me a shilling which I had lost although I had not announced the loss, nor did anyone else know he had found it." The Rev Batty gave four five shilling prizes for conduct in 1883 to J Robinson, Jonah Church, Ernest Towne and William Hipgrave. The next year Towne and Hipgrave were again the good boys, together with R Cannon and Emmanuel Chapman. "On November 5th 1886 the Rev G S Batty and W R Winch visited the school. I asked him (the latter) to give me notice of any hunting meeting about to take place and allow me to pick out, those boys who are best in their classwork." School terms were adjusted to meet the variations in the harvests; the hay harvest in June was more important than the corn harvest. Another sort of harvest, acorns, caused a school closure for nine days. That was an old activity but a new event occurred. When the agricultural labourers got the vote in 1884 the unprecedented number of voters meant that the school was required as a polling station. The Liberals won the general election, for the new electors in the countryside, kindled by Joseph Chamberlain’s fiery speeches, repaid the party which had enfranchised them. In spite of all the problems, learning took place. It was a notable event when another pupil teacher, William Pratchett, eighteen year old son of the bricklayer who lived near to the school, belonging to a family long established in the parish, completed his training and became assistant master at the Barnet National School. He continued to teach in the Sunday school and even, in a later emergency, took charge of his old school for a few weeks. "On Tuesday afternoon just at close of a singing lesson about a sq. yd. of ceiling fell striking me on the head and back. Fortunately no injury was done to anyone. Dismissed school at once the managers had the ceiling thoroughly examined in the evening a peat part being pronounced unsafe." "More of the school ceiling fell during Friday night last. The managers have employed an architect to thoroughly look over the building and report to them. He reports the roof to be hi a dangerous condition and the managers have decided to close the school for two weeks while a temporary iron room is being erected." After being used as a school for fifty years the old parish workhouse consisting of two or three cottages thrown into one, had to be abandoned. At that juncture, Edward Knowles having resigned through ill health and been presented with a purse of five guineas, William Lock became master. Coming from a Board school in Gateshead, in the State system, he was from a different stable, no church organist he. Perhaps he was drawn from that distant place by the prospect of a new school to be built. "It is to be hoped that many friends will contribute not merely to escape a School Board Rate, but as others have already done, from a desire to support Schools in which Scriptural Instruction takes its rightful place, and is not allowed, as we fear is sometimes the case in Board Schools, to be ill, or loosely, given, or put altogether in the background when the Government Examination draws near"
Demolition of the old school started in February 1887 and building of the new one in July, the banker’s lady from Potterells, Mrs Cotton Curtis laying the foundation stone. By June £828 had been raised or promised, mostly from parishioners. To help bridge the gap the vicar applied for a grant to the National Society, parent body of the schools, and was given £80. Asked to explain the size of the proposed building, he wrote: "The prospect of a large area in my Parish being ultimately let for building, renders it important to provide the new School with a larger number of School places than the present requirements of the Parish demands." The larger area he mentioned may refer to Little Heath on the Great North Road, at the extreme southeastern tip of the parish. Perhaps not, for as the vicar well knew a school had been opened there only three years before. The mover was Samuel Gurney Sheppard, stockbroker, temperance campaigner, benefactor of the parish and owner of Leggatts and 282 acres. In 1883 he had built in Thornton Road, Little Heath, a mission room, the result of, in the vicar’s words, "personal evangelistic labours at his own residence." House building was going on apace there. Thornton Road and other roads already had a dozen new small houses. Professional men, clerks and traders, with the people who served them, had come to live there. The drink trade at the Builders Arms, licensee William Axton, had started ten years earlier. The mission room became a busy centre for Sunday school, YMCA, YWCA, Bank of Hope and Bible and Prayer Union. At Easter 1883 150 people assembled for tea and a social evening. The need for a school was obvious and a parochial mixed school opened in the mission room in 1884. Within three years there were 115 children "on the books", but attendance was a problem, as in Welham Green, for the average was only 57%. Inspectors’ reports reflected the initial problems: "There has been, on the whole, decided improvement In the elementary subjects, and sewing is fair." The school was heavily dependent on voluntary subscriptions and often in debt to its willing honorary treasurer, S G Sheppard. Meanwhile at Welham Green the school closed for a week while the change was made from the iron room to the new building. There was a great gathering for opening day on 19 November which coincided with a meeting of the British and Foreign Bible Society. Six clergymen were present. Some of them were delayed by helping to drag a cart they found stuck fast in a ditch. The new school had two rooms, 40’ x 22’ x 11’ 6" and 26’ x 18’ x I1’ 6" , with accommodation for eighty boys. The master’s residence was complete with sitting robin, study, three bedrooms, kitchen and larder. The vicar considered that "The rooms, which do the greatest credit to their designer, looked remarkably well. They were capitally lit with Belge lamps, the walls being surrounded with texts of white letters on crimson background." He believed that the new premises, "may in some distant century be pointed out as a specimen of honest English nineteenth century work." The l880s closed with a new master as well as a new school. Benjamin Mallett, certificated second class, strict disciplinarian, "found the discipline very slack and wants a deal of attention". But in spite of the problems there had already been some achievement. It is perhaps too much to say that illiteracy had disappeared. As that decade progressed, however, only a few of the brides and bridegrooms were still unable to sign their names in the marriage registers. A generation earlier half of the grooms and a third of the brides could only make their mark. The poems which the children learned reflected the past forty years of peace and security enjoyed by Britain - Longfellow’s 'Village Blacksmith' and 'The Slave’s Dream', Tennyson’s 'Ring Out Wild Beds' and 'The Charge of the Light Brigade', Mrs Hemans’s 'The Bee' and 'The Voice of Spring'. They had little bearing on the period of this chapter, its imperialist sentiment, the South African War and the Great War of 1914-1918. The obverse side of imperialism was increased expenditure on education. The beginning of free education in 1891 and the Education Act of 1902 had their due effect in the North Mymms schools. The 1890s had a good start when examination in the three Rs as the basis for Government grants was abolished. Then, in 1895 liberalisation was carried a step further; inspection began to replace examination in all subjects. At about the same time, in 1891, by a political decision of the Salisbury Government, meant to help the voluntary schools which thought that they were suffering in competition with the Board schools, all school fees were abolished. In lieu, schools received a fee grant of ten shillings per head. No longer, in North Mymms, did labourers have to pay twopence per week, gardeners, gamekeepers and artisans threepence and others sixpence. Instead, the parish magazine announced, "Parents who are able to do so are invited to become subscribers in support of their own Parochial Schools." There was, however, no increase in the subscribers who continued to come from the gentry and a few of the farmers. Little Heath SchoolAnother change in the finances came from a different direction - the growth of Little Heath and its school. By 1890 the population of that hamlet reached about five hundred, a third of the whole parish, and it was growing fast. The attendance at the school held in the mission room was double that at Welham Green. Although the school was, for the time being, heavily subsidised by Samuel Gurney Sheppard, its founder and treasurer, it had a money problem. The parish vestry, faced with a choice between an appeal to parishioners and the levy of a voluntary school rate based on assessment for the poor, chose the latter, with the old, familiar warning that if it was not sufficient, there would be a higher rate imposed by a school board. It did turn out to bring in enough money. While the gentry continued their subscriptions, those people who volunteered to be rated, fifty-three of them, were the humbler, if substantial, folk, such as the Chucks, William Groom, Chas Honour, John Massey, the licensee of the Maypole. Thus the voluntary status of all the parish schools was preserved for the time being. "The Managers trust that the parents will co-operate with them in the effort to increase the efficiency of our Parochial Schools by encouraging the regular attendance of their children. It is obvious that however zealous the Managers and Teachers may be to promote the education of the children, the scholars must be at school in order to be taught, and a little further reflection will show how trying it must be to all concerned to instil into the mind of a scholar is frequently absent, the instruction which has been communicated with comparative ease to the regular attendant"
Mixed School "Singing is very sweet and tuneful, sewing is very fair, the children are well drilled and the discipline of the lower classes is improved; there is still some talking and unsteadiness; and a want of effort in the oral answering. Recitation is carefully taught, and there has been some improvement in arithmetic, but this subject should be more intelligent. Spelling is unsatisfactory, especially in the second and fourth standards, and the general level of attainment both in the elementary and class subjects is no more than fair. Infants’ Class "In spite of very cramped accommodation, the Infants are bright and happy, and orderly, and have been taught with much care and success, especially in the first class. The work is as varied as the limited space permits. The forms used by the youngest children are much too high." The long delay may be explained by the demand for money from another direction. Little Heath needed its own church for which £3,000 was collected. Christ Church, to seat 250 people, was completed and consecrated in 1893 and the first vicar, the Rev James Consterdine, was inducted in April of the following year. The new, separate ecclesiastical parish required also a vicarage but by 1896, £500 more had still to be raised. The school took second place to that. Alterations to the mission room would cost £1 ,000 and the cost of a permanent building could not be faced. Accordingly a "suitable iron room" to take 150 pupils was erected, by permission of the Education Department and through the liberality of the local gentry. It was opened in March 1897. The managers, led by the vicar of Christ Church and the vicar of St Mary’s, North Mymms, ensured that the religious instruction was of "the thoroughly evangelical kind, highly valued by the parishioners." No doubt the upheaval contributed to the inspector’s unfavourable report that year. Spelling, arithmetic and agriculture were poor, "and there is a want of intelligence in all the work". However, when John Appleyard left in the following year for another school he was so highly regarded as to receive a testimonial of £46, nearly half of his own salary of £110. At the end of his regime the average attendance had risen to 120, equal to the combined attendances of Welham Green and Water End and the record of 90% was better than either of them. Such was the difference between the new community of Little Heath and the older, agricultural part of the civil parish. The new master, Henry Cockerill, a young man of twenty-six from Hove, had a fair field. He was well staffed with an assistant master, infants’ mistress, sewing mistress, pupil teacher and monitress. In a few years the inspector was able to commend the whole school and when Henry Cockerill left in 1910 the attendance had risen to 180. This was more than could be accommodated and therefore, before he left, a major reorganisation took place. Under Balfour’s Education Act of 1902, which gave the authority for both elementary and secondary education to the county councils, building costs at a voluntary school had to be borne by the religious body to which the school belonged. The problem of enlarging or re-building again at Little Heath therefore took on a new aspect. Should the school be taken over by the county council or remain on a voluntary basis? In the second case the cost would be high. There was no doubt about the view of the North Mymms parish council, then only six years old. It resolved unanimously "That this meeting is in favour of the proposed new Schools at Little Heath being built by voluntary subscription", and it appointed a "Deputation of seven members to wait upon ratepayers to ascertain if they would subscribe." But it seems that the council was out of touch, for the move was unsuccessful. In September 1905 the school became a public elementary school (mixed) of the county council. It was that body which paid for a new building in 1907. The Welham Green and Water End schools, renamed "non-provided", remained voluntary under the Balfour Act, but with some differences. The Act was meant to help the voluntary schools. A J Balfour, Conservative prime minister in 1902, introduced the Bill. After referring to "the deplorable starvation of voluntary schools", he declared that "after all the great efforts on the part of the voluntary subscriber and after all the aid given from the National Exchequer, the voluntary schools are in many cases not adequately equipped and not so well fitted as they should be to carry out the great part which they are inevitably destined to play in our system of national education. Although the two North Mymms schools still had the burden of capital expenditure they now received rate aid. The managers retained control of the teachers (subject to approval by the Local Education Authority) and of religious instruction. However, a third of them had to be appointed by the authority. As though to express the new outlook, the girls’ school had a new headmistress. Mrs Letitia Haines retired after twenty-two years at Water End, receiving the gift of an umbrella from the children and a purse of £10 from the parishioners. Under her regime there was much emphasis on piety and needlework and the school was commended for its reverent tone and its skill with the needle. The girls were kept busy making handkerchiefs for church bazaars, .nightdresses, pillow cases, pinafores, and towels for Miss Cotton Curtis, daughter of the banker at Potterells; and at knitting gloves, scarves, stockings, socks and necklets. As before, lengths of serge and dress material were given annually as prizes for good attendance. The post of needlework mistress was an important one. "In spite of special difficulties the school as a whole is praiseworthy". But at the end of Mrs Haines’s reign the judgement was: "School most creditable to Head after many years of conscientious and creditable work." "The School should enlist, as far as possible, the interest and co-operation of the parents and the home in an united effort to enable the children not merely to reach their full development as individuals, but also to become upright and useful members of the community in which they live, and worthy sons and daughters of the county to which they belong." "At the girls’ school", wrote the vicar, "work seems to be prosecuted with vigour under our new headmistress." Her husband; who became assistant master at the boys’ school, offered an evening class for men at Water End. 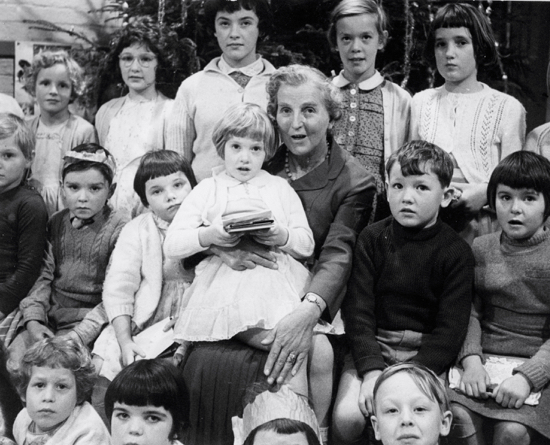 The year after she arrived Mrs Cooke introduced school meals, and a mid morning drink of milk or cocoa for a penny a week. She was well ahead of her time, the Education (Provision of Meals) Bill was not passed until 1906 and was merely a permissive Act Which was seldom operated. Other changes were made although the traditions of fifty years were not to be readily discarded. Religious instruction became gradually less prominent and the diocesan inspector commented: "a little disappointing - not so good as it should have been." The reports of Her Majesty’s inspector became more favourable, however, in respect of the girls at least: "the Head deserves great credit for the praiseworthy discipline and efficiency of the upper classes", "The upper classes taught with intelligence and success", "most creditable under most difficult conditions, crowded rooms and insufficient staff’. Perhaps some of this was due to another tradition, needlework, being weakened and the time saved given to reading. For the infants, however, it was another story; one of insufficient staff. "Infants instruction ineffective", "Infants want precise order, obedience and general interest or attention" were the inspectorial comments. It was the assistant teachers who taught the infants, and there was a continual stream of assistants arriving, and departing after a very short time, between 1902 and 1914. There were sufficient reasons for such a rapid turnover - the rural remoteness of Water End and the scarcity of proper lodgings, the inadequacy and insanitariness of school accommodation, the illness and disease and the accompanying interruptions to study. The inspectors, aware that the managers were responsible for the building, repeatedly criticised it. An additional room was built in 1905 but it did not escape the adverse comment that "the partition should have been carded to the ceiling." As late as 1913 they could still report: "The infants’ offices are dirty and unfit for use, and the path should be paved with bricks. The girls’ offices are offensive and need immediate attention. Paper should be provided in the closets. The urinal floor is very dirty and should be paved." All the same, the school grew in numbers to an average attendance of sixty girls and fifty four infants. About a mile away, at the boys’ school there was little change, except in Benjamin Mallett’s salary which had risen to £110 with the help of a Government aid grant. At the turn of the century the inspector commented "In spite of some efects, the general efficiency of the school is very creditable to the Master." Unlike the girls’ school, the school still depended heavily on the gentry’s generosity. Early in the twentieth century a new event was added to the list of school holidays for the children. It was Empire Day, culmination of the imperial and patriotic sentiment which stretched back to its origins in the Jingoism of the 1870s. Africa, "the dark continent", and the great powers’ contest for its territories aroused the chief public interest. In North Mymms Benjamin Mallett gave two lectures in the boys’ school, both in 1896. The first one, on France and the French, was given a few months after the Fashoda Incident. He deprecated any hostility between Britain and France; there was no danger from France. His second lecture in December was to give rise to different thoughts. The subject was Matabeleland, conquered by Jameson in 1893. In the same month Jameson launched his disastrous raid on the Transvaal. The Kaiser sent a telegram of support to Kruger; Germany was already the economic rival and potential enemy. The South African war was only three years ahead. "At our first Church Parade, held on Sunday morning, March 15th, the company numbering thirty six boys and two Staff Sergeants under the command of the Captain, did splendidly considering the short time they had been drilled and the trying ordeal of being audibly criticised by a large crowd. Nearly all the criticism was very favourable, and the devout behaviour of the lads in the Church was much remarked upon." But, although supported by Benjamin Mallett and inspected by the Archdeacon of St Albans, the company did not long survive its captain’s departure for Little Heath in the following year. Far more influential in the parish and more closely connected with the schools, was the Primrose League, the social and recruiting wing of the Conservative Party. A little group of gentry, led by Admiral Sir John Fellowes, met at Hawkshead House in that same year, to form the North Mymms "habitation" or branch, which was to continue until after the 1914 - 18 war. From the start the League established links with the schools. From the boys’ school Benjamin Mallett was branch treasurer; Miss Kate Parsons, assistant mistress at the girls’ school, acted as branch warden for Water End; and the warden for Little Heath was John Appleyard, headmaster there. Thus all the schools were covered. Entertainments and parties were organised and membership grew. Soon, the South African war was the opportunity to rally opinion. The branch considered "measures to encourage patriotism amongst adults and school children by means of drilling". At the relief of Mafeking it arranged a "patriotic entertainment at which four little girls in white frocks with red, white and blue rosettes" took up the collection for the Daily Mail war fund. "it was fit that some notice should be taken of the event, that it might be impressed upon the minds of the children, and increase their patriotic feelings which have been very much in evidence during the War. So, at 3 P.M. the Vicar and Mrs Pollock visited the school, and the former addressed the children, the National Anthem was sung, and prayers of Thanksgiving offered up by the Vicar, and afterwards extra recreation time was allowed to children. Tomorrow afternoon is to be devoted to recreation, the school being closed to further celebrate the Relief." Not to be outdone, the next day the boys at Welham Green had an hour’s play instead of the usual ten minutes, in honour of Ladysmith. Later, the Relief of Mafeking gave the children another day’s holiday, and the peace of 1902 yet another during which the children went in procession, singing the national anthem and the doxology. EMPIRE DAY was begun by the singing of the National Anthem and the Hymn ‘0 King of King’s During Scripture Lesson reference was made to the great Empires mentioned in the Bible and of our own. Lessons were afterwards given on the History and Geography of the Empire and the Great Men: A piece of poetry on Sir Henry Havelock was read: There’s a Land followed: Miss Hodgson sang the solo and the children joined in the chorus of "Rule Britannia’ The top boy held the Union Jack while the school sang the song: ‘The Flag of Britain ‘and saluted the flag; the morning terminated with the singing of the National Anthem and cheers for the Empire. A holiday in the afternoon by Council’s order. "Re-opened after the Summer Holidays. Many of the older boys are working in the harvest fields. A large Union Jack, 6 yards long, with flag staff 38 ft high, had been presented to the school by SB Pope Esq. I propose flying the flag every day when school is in progress. The Attendance Officer called and brought a large diagram of the Union Jack from the County Council"
"Empire Day was celebrated in accordance with the regulations of the HCC. After hymns and prayers, an address on the privileges and duties of British boys and girls was given by the Head teacher, followed by the reading of selected passages bearing on the subject. Rudyard Kipling’s Children’s Song and The Flag were also read." When war broke out in 1914 the school children, as well as their parents became wholly committed. The children lost their fathers, some for a period of years, some for ever. By the end of August 1914 over sixty men of the parish had volunteered. When peace came 268 men had joined the forces; of them forty six had been killed and some seventy wounded. The meagre allowances for soldiers’ dependants made the wages paid for children’s work, as well as for women’s, more necessary. The children’s contributions to the war effort were various. They picked enormous quantities of blackberries for the Ministry of Food. In one year the Welham Green and Little Heath schools gathered 616 pounds. The boys brought in half a ton of horse chestnuts in 1917 for making explosives. More significant, for the whole country as well as for North Mymms, was the relaxation of the laws preventing child labour. The farmers, under pressure to produce more food, were acutely short of labourers. From the beginning of the war Benjamin Mallett continually reported illegal employment of his pupils, only to be told that the Attendance Committee would not prosecute. In 1915 the Hatfield Agricultural War Sub Committee wanted the school attendance bye-laws suspended so that not only boys, but also girls, of twelve years could work on the land. The boys’ school was closed periodically for haymaking, harvesting, potato picking and setting. At Little Heath the problem was less acute though at one point seven boys left for land work, "three of good educational promise". The first device, in 1916, to meet the situation was the official issue of certificates to older boys granting exemption from school for from one to three months. In May that year eleven boys at Welham Green had three months’ certificates. All the same, illegal employment of boys without certificates still continued, unchecked. The next device to regularise the position, the Extended Holiday Scheme in 1917, released older boys for work while keeping the younger ones in "vacation classes" in the older ones’ absence. This meant that boys of twelve were away from school for eighteen weeks in the year instead of the normal ten weeks’ holidays, and those weeks were "taken earlier or later according to local agricultural requirements." The vicar, reporting the new order for boys of twelve, wrote: "While we are all war weary we must realise that the time has come to redouble our efforts." Shooting parties had to continue; boys for beating at North Mymms Park were still absent from school as if there were not enough other causes of absence. The girls at Water End also made their contribution. The school staff was reduced by the appointment of a monitress in place of a teacher. Gardening and domestic economy, taken at Hatfield, entered the curriculum; slates, instead of paper, came back into use. Work for the Red Cross, at the request of the director of education, produced vests, mufflers, shirts, socks. The older girls had to be kept at home to bring coal from the sidings to theft homes, "as it cannot now be carted." Epidemics closed the school for five weeks in 1918. Examinations had to be postponed on this account or because of the shortage of teachers. "At noon today I received intimation that the Armistice had been signed. The school flags were at once hoisted. This afternoon, instead of usual singing in school, I marched the boys round the village singing National Anthem and patriotic songs. This was much appreciated by local residents and thoroughly enjoyed by the boys." At the peace celebrations, held in the school, the old boys presented him with "a handsome gold watch as a token of their respect, honour and affection for him." In the autumn of 1919 he offered an evening school where boys who had missed schooling could learn some history, geography, arithmetic, reading and composition for two shillings a head. "The school had been handicapped by long closure and much sickness, which no doubt accounted to some extent for the low standard of efficiency reached in certain subjects. The teachers were kindly in their treatment of the children and most earnest in their desire to improve the teaching. The teachers should visit other schools to observe their methods. A school library would improve the general intelligence and response." "The Schools being established on such a distinctive basis as the Girls and Infants School at Water End and the Boys School at Welham Green, necessitated the great Majority of the Children having to walk long distances in all weathers to attend School. I have been in communication with a great number of the parents and without exception they were all agreed that the present system of having to pass one School to attend another only because of the distinction was more of a fad" than a necessity, and the parents attributed a great deal of the illness among the Children to the fact of having to sit in School in their wet clothing, whereas by a rearrangement of the Schools, a very great many of the children would have a much shorter distance to walk and would not run the risk of being continuously wet through in the bad weather." The parish council resolved to ask the school managers to make mixed schools at both Welham Green and Water End, but it was persuaded to let the seventy year old problem stand over until after the war, in the belief that the county council would act. The result was to come later. Wars produce Education Acts: from the Great War came the Fisher Act of 1918. The effects of that, if any, on the parish schools were also in the future. In education the Fisher Act of 1918 did not have the hoped for results, particularly in respect of day continuation classes. It did, however, because of the exploitation of children during the war, fix the school leaving age at 14 and restricted the employment of children between 12 and 14 to two hours a day. In North Mymms the aim was now to restore the standards of the pre war years. The war, as wars do, had begun to stimulate new ideas. At the girls’ and infants’ school there were signs of the times. In 1919 a woman joined the school managers for the first time, Mrs Kate (later Lady) Clausen, banister’s wife, and she made her presence felt at Water End, often calling to inspect the school, the registers and the needlework and donating prizes for needlework (to M Chuck and D Street). Miss Seymour of Potterells, assisted by Mrs and Miss Wilson Fox of Moffats, taught folk dancing. Six new dual desks replaced old gallery desks. Naturally, some of the old traditions remained, albeit weakened. The lengths of serge were still given under the Casamajor bequest but since the dividends from it had fallen, only a few rewards could be given on the basis of stricter limits of attendance. A more notable event was the retirement of Mrs Cooke in 1920, the headmistress who had been the brave new spirit of 1902, and the presentation to her of a pair of silver candlesticks from the managers’ funds. One happy reward for her work was the success of her pupil teacher, Dorothy Field, who came top of the list in the county in the preliminary examination for the teachers’ certificate and proceeded to training college. Miss Field, as Mrs Colville, was herself to be headmistress at Water End nearly thirty years later. From many applicants for headmistress in 1920 the managers appointed Miss Elsie A Simon from Chiddingstone School, Bucks. The new headmistress, a member of the National Union of Teachers, had a passion for drama and, later on, she had the girls dress up and act out the stories they read in the books from the school library. She had one assistant teacher, a pupil teacher and a monitress to teach 92 pupils in three rooms. Changes in the staff were frequent; there were eight such changes in the 1920s. The managers took an unprecedented step towards solving the old problem of accommodation for teachers by renting, from the lady of North Mymms Park, a house for two new teachers who paid ten shillings a week (including furniture). They granted Miss Simon’s request for £5 for a school library, long overdue, but they were not prepared, or able, to spend money on the eighty year old school building. When, in 1925 His Majesty’s inspector recommended improvement in ventilation, cloakrooms, "offices", playground, lighting and furniture, only the first was seen to and only after a long delay. £74 had been spent on the building only a few years before. Religious instruction continued in its proper place. The diocesan inspector could report that "The atmosphere of the school is reverent and the children are well in hand", and at the end of the 1920s - "Real care and thought are being given to the Religious Instruction." At that time, also, the managers found the HMI’s comment on the general education "very satisfactory". The major and ultimately decisive issue of the 1920s and later, was one which concerned both the girls’ and the boys’ schools. It was the one, which had been raised in the parish council during the war - whether the boys’ school could have a mixed infants’ department. The purpose was to save the little children from walking long distances in all weathers to Water End. The issue developed into a larger request for both schools to be mixed schools. Only six months after the war the matter surfaced again in the parish council. It was then taken up by the Rural District Council which was told by the County Council that it would not reorganise the schools because of the cost, that the managers had no funds, and that the County Council’s only course would be to build new council schools three quarters of the cost of which would fall on the parish, since there was already sufficient school accommodation. The District Council asked the managers if, as a smaller project, mixed classes for the 5 to 7 year olds could be made at Welham Green, but without success. These events began a fifteen year long conflict. Another parish council "demand" for mixing the infants was followed by a parish meeting at which the managers "apparently satisfied them that it was not possible". The meeting was content to resolve that there should be an infants’ class at the boys’ school as a temporary measure. Pressure continued, however, and again in 1923 and in 1924 parish meetings renewed the request. It was pressure of another kind, which provided a break through. A request from the County Council to reduce one teacher at the boys’ school because of falling numbers was met by transferring twenty infant boys only from Water End to Welham Green, and this was at last done in September 1926. Thus expediency spared the little boys their long trudge from Roestock and Welham Green; those living at Water End remained at the girl’s school. The event was decisive for the future of both schools. The roll at Water End began to fall, that at Welham Green to rise. Not surprisingly, the managers were still more disinclined to spend on the girls’ school. Moreover, it would be possible to transfer sums from the Casamajor dividends to the boys’ school. "Mr Mallett concluded his life’s work at the Boy’s School on September 29th. For more than thirty-three years he gave of his best to the important work of teaching the boys of this Parish, by precept and example, moulding the characters of those who were to form part of the manhood of the nation. During that long period he made hosts of friends, and not a single enemy. His boys have left the school - many have gone forth to lands beyond these shores, but all, wherever they may be, regard their old master with the greatest respect and affection. 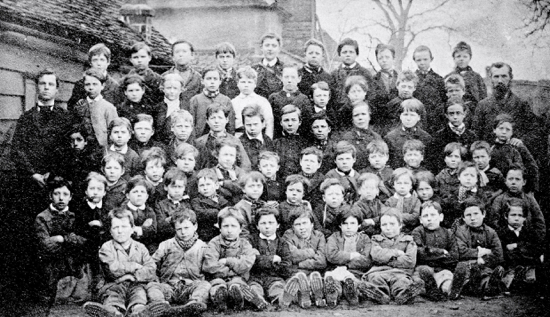 Many of them are parents, whose boys have also been taught by Mr. Mallett, and these have delighted to commit their children to his care, knowing that their education would be in the best of hands and that they would receive the same kindly treatment that had been meted out to themselves in their youth. Mr Mallett has decided to remain amongst us, and it is the hope and prayer of us all, that his health, which is much impaired, may speedily be restored, and that he may live for many years as an honoured inhabitant of North Mymms. The Parishioners of North Mynns herein named wish to express the respect and admiration which they have always felt towards their late Schoolmaster, Mr Benjamin Mallett, who has been for thirty-three years the tutor, guide and friend of each lad who has had the good fortune to come under his benevolent care." Out of no less than seventy applications for the post of headmaster the managers appointed F W Merritt, assistant teacher at South Mymms, and Miss Lines as supplementary assistant. The managers were soon faced with heavy expenditure at the boys’ school. Water supply, which had been refused in 1913, and improved drainage were to cost £109. The new headmaster was already active, organising whist drives to raise funds. He himself needed a new pump and a new copper in his house. Attendance rose because of a higher birth rate after the war and the county council at last agreed to an additional teacher to relieve the strain. Forty new desks came from the council while the school piano was repaired. One of Merritt’s innovations was to promote "the more intelligent and industrious children" at the end of each term instead of annually. The HMI’s report was, in •the managers’ view, "a credit to the school". But after only four years, in 1926, the headmaster resigned on gaining promotion in Welwyn. He left behind a model school garden and his boys won a certificate of merit in competition for a challenge cup for gardening. His successor, A J Bradbeer, assistant at Cowper School, Hertford, remained much longer, in the Welham Green tradition, for another twenty-three years. He was a keen games player and organiser of school sports. This was the same year in which the infant boys were transferred to his school from Water End. Clearly his school had a future. The managers seem to have recognised this by agreeing to an expensive folding partition in the big schoolroom and by providing gas in the headmaster’s house. "Much of the record is, unhappily, of recurrent setbacks, frustrations, and outright failures: the dropping of the day continuation school scheme; the savaging of teachers’ material prospects by the Geddes and May Reports; the repeated failure to raise the school leaving age; the stillborn compromise of the 1936 Education Act; the exasperatingly slow progress of ‘Hadow reorganisation’ in many rural district, and among church schools; the virtual cessation of new school building between 1931 and 1936; the concurrent serious unemployment among teachers, due partly to financial stringency, partly to falling school rolls..."
The significant word in that passage is Hadow. The Hadow Report of 1926 on The Education of the Adolescent shaped English education for several decades by its recommendations for primary (not elementary) education and secondary education for all in grammar, modern and technical schools. The change from one to the other was to be at eleven years and the minimum leaving age to be 15 years. Since the governments of the day could not face the cost of these proposals they went for the easier and cheaper reform also recommended by Hadow; dividing the all-age elementary schools, such as in North Mymms, into two departments, primary and senior. But reorganisation in church schools was slow. The cost to the managers was likely to be heavy, even though under a later Act of 1936 grants of up to 75% could be made for buildings "for the benefit of senior children". With all these ideas current, the school managers were in for a busy time until 1939, though not so heavily as after the war. They were joined by Dr Flora Shepherd, Capt R Rushbrooke and Mrs Buxton, the new vicar’s wife. Following extensive criticism of the boys’ school building by the inspector, in the light of Hadow reorganisation, the managers opened a school extension fund in 1934. Subscription lists were opened; a garden party at Frowick, a church collection, a concert, a carnival dance at the scout hut, a sale, Bradbeer’s boys playing the handbells, a gift of two turkeys, all contributed to bringing in £328 in one year. £73 had been raised by the headmaster himself and the vicar gave generously. It was enough to pay for minor works - a new water closet, bigger urinals, modification of the wash house and additional lighting. The managers postponed the larger alterations recommended. Meanwhile the new ideas stimulated both the parish council and the recently formed Ratepayers’ Association. Both bodies wanted the infant girls, as well as the boys, transferred to the Welham Green School. The Association went further in requesting that both schools should be mixed ones, and it expressed its concern whether the North Mymms children were getting the same facilities in practical subjects as in other parts of the county. It was told that two mixed schools in the parish were unnecessary and impractical; and that as regarded woodwork, the boys were having instruction at the Hatfield centre, which was better equipped than the school workshop. At last, however, the little girls won the day. The inspector had made no objection to a few girls aged 5 to 7 going to the boys’ school provided they had their own toilet. They were duly admitted in January 1935, nine years later than the infant boys and twenty years after the whole issue was first raised. There were now nearly 150 pupils at Welham Green. Later that year HMI’s report on both schools was considered satisfactory. The time has come when it is necessary to appeal to the parishioners for help towards the extension and improvement of this School, which in some respects is inadequate for modern requirements. The rebuilding and enlargement of the main entrance to provide additional cloak-room for boys. The alteration of the infants’ cloak-room to do the same for infants. The re-surfacing of the playground. These items will cost about £450. In addition, the infants’ classroom is already full, and it is evident that either another classroom or an assembly hall will be required in the near future. Why are these things needed? The children’s coats, when wet, are hung on top of one another and cannot be dried. In wet weather there is no covered room for exercise and games, and the playground is a quagmire, whilst in dry weather it is unfit owing to stones, for children’s use. The infants’ class-room is too crowded for satisfactory teaching. Appeal. At present the Managers appeal for subscriptions for the £450 which is immediately required. The Parochial Church Council has agreed to give two Sundays’ collections towards this object, and it is hoped that we may receive grants from the Diocesan Fund and from the National Society. But it is obvious that generous help must be obtained from other sources as well. We can remember with thankfulness those who in the past built the School, and the excellent work that has been done there under successive Headmasters. As a Church School it stands for the principles of religious education and for the grounding of the children in the Christian faith. It is for the sake of the children that the Managers ask you to help. It is hoped that present and past scholars and their parents will give as they are able. Small subscriptions, as well as larger ones, will be welcomed. The need is immediate. The work must be carried out this year. Please give now. Subscriptions will be thankfully received either by the Vicar or by Mr A J Bradbeer at the School. To the managers’ relief County Hall agreed that additional cloak rooms and improved heating would be enough for the present, so that the larger works could, if necessary, be left over again. Collecting money still went on; the boys by amassing Daily Mirror and Daily Sketch coupons and by making a mile of pennies, the parents by running a coconut stall at the fete. But the school extension fund now had a serious competitor for money in the proposed village hall. And so when in 1937, the managers considered tenders for the school extension they decided to leave the work in abeyance. The reason given for that decision was that the managers had first to know how the Hadow Scheme of reorganisation would affect them. They discussed the future of the two schools. If the girls’ school was to be closed, the financial situation would benefit from transferring the Casamajor endowment to the Welham Green school. Eventually, in 1938, they agreed that when the Welham Green school was extended it should provide for all the girls and then the two schools would be combined. In the mean time the extension fund had to continue. A performance of Midsummer Night’s Dream brought in £60. By the year before war the fund had .accumulated a large sum, thanks to village activities as well as handsome contributions from some of the gentry. All ranks had raffled. The use of the fund would now wait until after the war. "During 1930 the normal conduct of the school was much interrupted by a series of staff changes but since September last already work has been done to make good lost ground. The essential subjects are in very fair condition. Compositions written on the day of inspection showed that the children have plenty to say and are able to express themselves on paper with some fluency. The result in arithmetic were especially praiseworthy. The schemes of work were recast in geography and history." "It gives the greatest pleasure to visit this school Its tone and general character are distinctly good, and there is every good reason to feel that both teachers are doing the work in a thoroughly conscientious way." The children had numerous holidays and trips: for the jubilee of George V, for the Coronation in 1937, for the Hatfield Show, for the Military Tattoo at Aldershot and, as before, for Empire Day, celebrated with a Maypole and folk dancing and, of course, appropriate lessons. The bright girls could do well. What seems to have been the first success in the eleven plus scholarship examination occurred in 1937 when Constance Bevan won a place at Queen Elizabeth’s Grammar School, Barnet, and before 1939 at least two other girls, Isobel Clark and Beryl Honour followed her. Some others would have gone too if their parents had been able to afford the expense. Parents who could afford to pay school fees, and who preferred private education, were more usual in. the new commuter village of Brookmans Park which was expanding rapidly in the 1930s. There was provision for them; a preparatory school in Moffats, The old house where, by a curious irony, had lived Miss Caroline Casamajor, the benefactor of the parish school at Water End. From the following description it seems that nothing was lacking. Situated on a hill at Brookmans Park with twelve acres of playing fields and gardens, is Moffats preparatory day and boarding school for boys, with a pre-preparatorv section for little boys and girls. Boys are prepared for entrance and scholarships to the public Schools and Royal Navy. Special attention is given to music. There are Squash and Tennis courts for the boys besides the usual games. The School can call daily for pupils living at a distance and take them home. Grade A tested milk only. Vegetables, jam and eggs are home produce. Health in charge of trained nurse matron. Sole charge of boys with parent abroad. Fees are strictly in accordance with modern conditions inclusive of "extras" for boarders. Prospectus from Messrs Engleheart and Foxon, Moffats, near Brookmans Park station. Although it is not likely that the school came within any inspector’s purview, no doubt as much attention was given to "tone and general character" as at Water End, even if of a different kind. During these years the greatest changes in the life of the parochial schools took place. The future of both schools, until then in the balance, was decided. But first, the war had to be won before anything else. Even before it started, during the Munich crisis, 153 children from London were billeted in the parish, though they soon returned. The parish council resolved that "We in North Mymms Parish do not think tat this Parish is a fit place to bring children into". This opinion had no effect, for children came again in the real crisis of war, from two London schools, Highgate Mixed and Infants council school and a Roman Catholic school in Chelsea. Fit place or not, the parish did its duty by the evacuated children. When the air raid trenches had been dug and the school windows blacked out, the buildings were ready for the evacuees. Their head teachers publicly thanked the school managers, teachers, billeting officers and foster parents of North Mymms for their kindness and generosity in the upheaval. The school children, both local and evacuees, became part timers, the local children occupying the schools in the afternoons, while the evacuees had the mornings, with an overflow in the scout hut in Dixons Hill Road. No less a person than John Newsom, county education officer found time to visit the parish and confirmed the arrangement. It was improved after a few months. The Highgate children went to Moffats, Brookmans Park; the preparatory school there had been evacuated to a place of greater safety. The Roman Catholic girls attending Water End took their lessons in the scout hut. 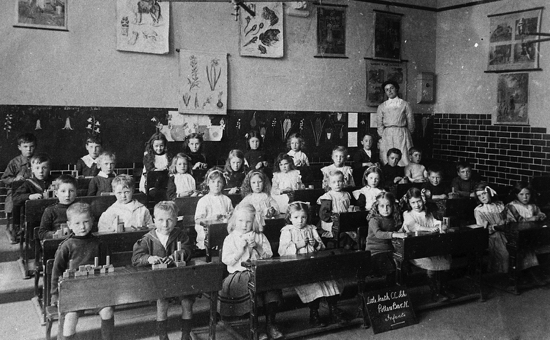 The middle classroom at Water End was still, however, occupied by the Highgate infants. This loss of schooling was the main educational casualty of the war. There was one echo of the past. Shortage of labour for potato lifting in 1941 brought one large farmer, who was also a school manager, to complain that "The present method of getting schoolboy labour is very involved". His fellow managers saw the point and agreed that the head teachers should make lists of children over twelve to be released from school. A second farmer informed them how well the boys had worked on his land. The girls were not left out, fourteen of them had permission from County Hall to do the same work. No doubt everyone was pleased, except the teachers. Another casualty of wartime was the shortage of staff and the absence of any new building. When overcrowded classes occurred at the boys’ school in 1943 because of an influx of infants of both sexes, the only solution offered by the county council was to increase the class size to forty-eight by installing additional furniture. That commodity, at least, was available. But there were only two applications for assistant teacher at the girls’ school in that year. Damage of a different kind happened to the girls’ school towards the end of the war. A fly bomb blasted it so that the roof, ceilings and windows needed extensive repairs, which were carried out by the county council, without cost to the managers. Another danger occurred, though from friendly troops. The school had to be closed repeatedly because a sewage overflow from the American hospital in North Mymms Park came up through the drains into the playground. All the effects of war were not negative. Children were better fed. The very young ones also had some education for the first time. A "War Time Nursery School" for children of two to five years whose mothers were in war work (including domestic service) started in Welham Green in 1942. For one shilling per day the infants could be given breakfast, lunch and tea, and be cared for by a "fully qualified matron and staff’. There was room for thirty infants but at the opening only eight appeared, and the parish council thought it its duty to inform county hail that the whole thing was too expensive, though it did not incur a penny of expense itself. Meanwhile, the private sector in education, reduced by the evacuation of Moffats school, was reinforced by a school at 39 The Grove, Brookmans Park. At Ithaca House school about thirty children of all ages between four and ten years received instruction in the sitting room of number 39, in the space left by the fireplace, shelves, pianola and the teacher’s table. Overcrowding was not peculiar to the Welham Green school. Boys and girls were prepared, often successfully, for grammar school in a whole range of subjects: arithmetic, English, history, geography, nature, scripture, music, as well as in the arts of painting, poetry, handwork and drama. The school did not close until July 1949; most of the thirty-three children transferred to Little Heath county primary school. Another wartime blessing was school dinners, though for the pupils at Water End it was, for a time, a mixed one. At first they had to walk to Welham Green for their dinners and, not surprisingly, few wanted to. It was only when dinners came from the Dellsome Parade canteen and when, marvellous to relate, the county council built a kitchen at the school, that every girl except two had dinner at school. In fact, although there was a cloud over the future of the girls’ school, resources continued to be given it. Gas was laid on to replace the paraffin lamps, which gave a poor light, and paraffin had become scarce. Half the costs of a new sewer and repairs to the school building and the house were met by the managers. When Miss Simon, headmistress for twenty-three years, retired in 1943, Miss E Smith from Bognor was appointed from twenty-five applicants for the post. Miss Simon had, the vicar wrote, "faithfully maintained the religious basis of teaching and the highest moral training." "Amongst all the proposals which are being put forward for the rebuilding of our national life, those which concern education are among the most important. The majority of our children have hitherto ceased their education at the age of 14 and have been thrown into the world with insufficient training to enable them to meet the claims of their homes, their country and their own wellbeing. The future of the country depends upon the children being fully equipped as decent, responsible and happy citizens. It is therefore, a matter of great importance that the Government has now issued their proposals "to ensure a fuller measure of education and opportunity for young people, to provide means for developing the various talents with which they are endowed, add so enriching the inheritance of the country whose citizens they are." It is impossible to summarise these proposals here, but it is an opportunity to consider how they may affect our own schools. No doubt it will be more than ever necessary for us to carry out the alterations and enlargement of our Boys’ School which have for long been demanded by the Education authorities. The Government now offers to provide half the cost of such alterations. This offer seems too good to be missed. It is fortunate that we had already begun to raise a find for the purpose, and although some of it has already been spent, we still have over £450 in hand. I hope that we shall do our best to increase this fund, in order that when the war is over we may be able to provide a school which will be worthy of the great part which our children will be called upon to play in the future of our country. The Butler Act provided that church schools could choose between ‘Aided’ arid ‘Controlled’ status. Aided schools were treated generously. They were to receive grants to cover teachers’ salaries, towards the cost of alterations to buildings and towards internal and external repairs, while the managers were still to appoint teachers. A controlled school, on the other hand, although it could also continue denominational instruction, passed completely under the financial control of the local educational authority, which also nominated a majority of the managers. "Every primary school should have decent lighting, ventilation, cloakrooms and offices; a reasonable place of assembly should be available, together with an adequate area of hard playground for physical training. There should be at least one room available for the staff and a separate classroom for each class in the school based on class units of not more than 35." Only too soon, in November 1944, diocesan, county hall and Ministry officers visited the girls’ school and made known their decision that "There must be no question that this school should be closed and the children transferred to the other school at Welham Green". The managers registered surprise and indignation. They had expended £215 recently on the school, the schoolhouse and the sewer, the county council had built a kitchen there, the new head had improved the education, the roll had risen to fifty-eight. All possible efforts had been made to improve the school, which was now more satisfactory than at any other time. Moreover, they shrewdly pointed out, the additional accommodation required at the boys’ school could not be built for a long time in view of the national shortages of materials and labour. They would request a meeting with the diocesan director of religious education. All this was of no avail, for the diocesan board and county hall confirmed that the school could not be satisfactorily reconstructed. It had already been decided at county hall that there would be in due course a secondary school "at or near Bell Bar", and it would be the Welham Green school which would send their eleven year old children there. Thus at the end of the war the facts about the girls’ school had to be faced. Neither the managers nor the headmistress could know that the school still had another fifteen years to go, albeit under different management. The headmistress was, naturally, sufficiently concerned to make the novel suggestion that she should attend the managers’ meetings. There was strong objection to this at first, though it was later accepted as a sign of the times. Her request for electricity at the school could not be met but it was supplied to her house. There was then a curious complaint by one of the managers that, according to village report, the girls were singing hymns during most of their time in school. Perhaps such activity could be regarded as an appeal for divine intervention in the future of the school. In any case the managers rebutted the charge. It seems wisely, for the girls, along with the boys, received high praise for religious instruction from the diocesan inspector. It was otherwise with the girls’ physical education. The facilities were reported to the county council to be very poor, both inside and outside with all infants and juniors under two teachers. There is no playing field nearby and dancing is practised in a small classroom, which is cleared for each session. The playground is unsurfaced and inadequate", and as an addendum - "There is no electricity in the school." Nor was the sustenance for physical education, the school meals, in much better shape. Of the forty girls and four infant boys, between five and fourteen years, only three-quarters took the dinners, perhaps because they had to be brought from the Hertingfordbury Cooking Depot. The old difficulty in appointing an assistant mistress, the lack of accommodation, did not help. "As many of you are await the last Education Act is making a great deal of difference to the Church of England Schools throughout the country; and our own diocese throughout this year is making a special effort to save as many of the Church Schools as possible by bringing them up to the standard required by the Board of Education, and a major portion of the money raised by the Bishop’s Appeal will for this year be directed to this end. Here at North Mymms we have our own problems, and the School Managers, the Diocesan authorities, and the Local Education Authority have briefly agreed to close the Water End School at some future date, and transfer the children to Welham Green, which will have to be very considerably enlarged, and brought up to the required standard. Application is being made through the appropriate channels that the school may achieve "aided status" and thus ensure that one school in the parish may in future be a Church school This cannot of course be done without money, and that which the managers have in hand will need to he considerably increased. Already the interior of the school has been painted and during the summer holidays it is Intended that the school shall be re-floored Subscriptions for our own schools will be gladly received by the clerk, to the managers Mr H Laurence, at Twysdens, Dixon’s Hill Road; or if subscribers prefer to give to the wider diocesan scheme - which of course will assist us if in need, then these should be contributed through the Bishops Appeal Fund to our Bishop’s Courier, Mr R Colville of Hill Holme, Dixon’s Hill Road. It may not be generally known that three boys and two girls have this year been awarded places in Grammar School and two boys have qualified for places in Technical Schools. This reflects great credit not only on the children themselves, but on the schools which have trained them and sincere congratulations are due to all concerned. Approximately, the Welham Green School caters for one hundred children and Water End forty. Too often our local schools are just taken for granted, and it is a good thing that front time to time a little lime-light should be focussed upon them, and their present and future needs should be made known." As it turned out considerable financial help had to come from diocesan funds. Plans were prepared and approved by county hall. The school received Aided Status from the Ministry. The extension was to be in two stages, the first consisting of one classroom and a lavatory block. It was eventually opened in 1953. Meanwhile there was competition from Brookmans Park. The rapid development of that new commuter village before the war had produced many more children who either attended private schools or travelled to the council school at Little Heath or the church schools in North Mymms. 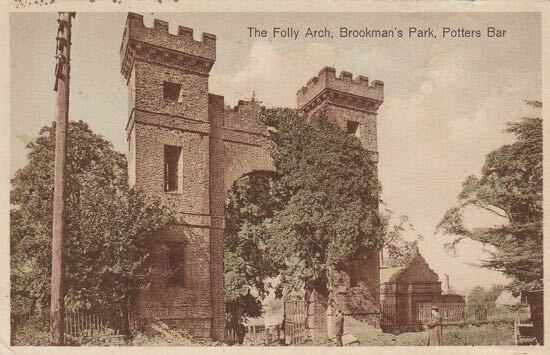 Soon after a parish councillor had, in 1946, pointed out how inadequate the provision was, the county council agreed to a junior and infants school at Brookmans Park, and the first instalment was started three years later. This development gave rise to some anxiety among the North Mymms managers. They requested an assurance from the county council that the Brookmans Park school would not have priority over "our extension". The children also were affected by reorganisation. Early on, those over fourteen were to go to St Audrey’s school, Hatfield. The school leaving age had been raised to fifteen in 1947. Some families wanted their children to stay at school beyond that age but could not afford it. The parish council, aware of this, asked the trustees of the parish charities if the money for apprenticing that had accumulated could be used to the benefit of such children for expenses on books and clothing. Nothing came of it because the accumulation had been spent on needy widows, but the proposal was several years ahead of an official recommendation for better maintenance allowances. In 1948 there was a party at the boys’ school for all those over eleven who were going to other schools at the end of the term. That year the vicar announced that all the eleven plus children would be going to Howe Dell secondary modern school, Hatfield. Chancellors School was still a gleam in the eye of the county education officer. The vicar accepted the change but regretted that he would no longer be teaching the top classes. The boys’ school, now called the North Mymms Church of England Mixed and Infants School, suffered the severest blow when the headmaster died suddenly in 1949, aged only fifty-one. Alfred John Bradbeer had been leader of the boys’club, captain of the cricket club, choirman, and had served on the parochial church council and in the Home Guard. Greatly missed by the community, his ‘passing must have been deeply regretted by pupils and ex pupils alike. His discipline had relied on the cane far less than his predecessor’s had. The over riding fact of the l950s was that the population of the parish more than doubled, from 5526 to 12522, caused partly by house building, partly by the post war birth rate. More children put pressure on the schools. The managers felt it. "With the rise in the child population in the parish", wrote the vicar, "both our schools are outgrowing their capacity. It all goes to show how urgent is our work for school reconstruction and how greatly I and my fellow managers hope we shall have no further frustration and disappointments forced upon us by the difficulties of the times." It was to be a pious but vain hope. "In order that any possible misapprehension may be allayed, I wish to make the position as clear as I am able: In order to pay for the reconstruction of the Boys’ School at Welham Green, a large sum of money has been borrowed from the Diocesan Board of Finance, and the building of the Girls’ School at Water End has been pledged as security. This money must be paid in approximately two years, and this can only happen if the Water End school building is sold. The local education authority has decided to purchase it and after purchase to establish there a County Primary School. Therefore until such purchase is completed. - in about two years’ time - both Welham Green and Water End remain church schools, Welham Green for Boys and Infants, and Water End for Girls and Infants After the purchase there will thus be both a church school and a state school and parents can send their children to which they prefer, provided there is adequate accommodation in the school of their choice. It seems likely - though this is not finally settled - that at the expiry of the two years, both schools will take boys, girls and infants, but remain as they are - namely, boys at Welham Green, girls at Water End and infants at both." "The statutory two years notice given by the mangers of the Girls' school to the Local Education Authority has elapsed, and the situation at Water End is now that the school has become a County Primary School housed in a building belonging to the Church, and negotiations for the sale of the property to the L.E.A., are now taking place. Though Water End has thus now ceased to be a Church School in principle, it is unlikely in practice that its relationship to the Church will be greatly altered during the time that the present Vicar and the present Headmaster hold their respective offices. This change of status will however have its repercussions upon the Boys' and Infants School at Welham Green, which now becomes the only Church School in the parish. At their meeting last night, the managers decided that in the altered circumstances, it is now desirable to turn the Welham Green School into a Mixed School in order that girls may continue to be educated there after they have reached the age of seven. The managers feel that this suggestion will have the backing of the Headmaster and of many parents in Welham Green, and this resolution has been forwarded to the Local Education Authority for their comments, and until these are received, no decision can be made; but the managers hope that it may be possible to make this change of policy effective within a short time." The headmistress referred to was, and had been for five years, Mrs Dorothy Colville formerly, as Dorothy Field, pupil teacher at the school. The vicar continued his regular visits. "The Managers of the Aided school have undertaken to reconstruct their school to provide for the junior pupils (a four-class school) leaving the County Council to provide for the infants (a three-class school). The Managers have already carried out major improvements to the school. In 1951, they provided a first instalment consisting of one new classroom and lavatories; at the moment, a second stage of the improvement consisting of two classrooms is being erected. One of these classrooms is being paid for by the LEA to replace a smaller room, which is being turned into a kitchen. This school at Welham Green has 130 children on the roll, rising in the summer term to 150, and with new developments going on in the area (172 houses are in the course of erection) will be unable to deal with the additional pupils. A three-class infants school is proposed to allow the Managers of the Aided school to take junior pupils only when it is completed." The worst problems were still to come. In September that year, the children were occupying the two classrooms recently completed in the Welham Green School but more still arrived. By 1958, the number there had rocketed up to 211. 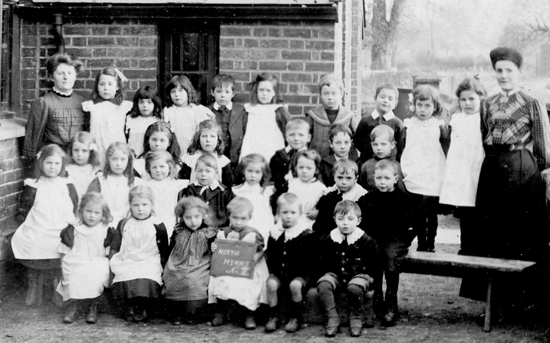 Two classes had to be held in the Memorial Hall; the proposed new county school for the infants at Bushwood, Dellsome Lane, was not yet on the ground. Yet the roll at the council school at Water End had fallen to thirty-nine. Something seemed to have gone wrong with the forecasts. Teaching under difficulties continued at Welham Green. Fortunately, there was now a school library of about four hundred books. The managers were able to congratulate the head master on "the attainment of seven successes in the 11-plus examination". Her Majesty’s Inspector visited and expressed his satisfaction, though pointing out that in a school of such size the headmaster should not have a class of his own to teach. The parent teacher association was active and began to consider, optimistically in the existing conditions, a swimming pool, stimulated perhaps by the initiative at Brookmans Park where the primary school had opened in 1951. The PTA also wanted to know about opportunities in further education and was enlightened by the principal of Mid Herts College of Further Education. But staffing problems remained. There was a continual struggle to get additional teachers; one applicant for part time work was immediately offered a full time post. The Rural District Council could not help with the old difficulty of accommodation, in view of its waiting list for houses. The situation was not acceptable and it was clear that yet another addition to the building was needed. The managers debated, in 1960, "whether to keep up with The developing district", or not. The diocesan authorities had already advised them to go no further than a 4-class school for 160 children, leaving the local education authority responsible for any excess. They bravely decided, however, to build two more classrooms and extend the assembly hall. They hoped that before long the new Bushwood School would take their infants and the classes in the Memorial Hall would return to their proper place. Their decision to "keep up with the district" involved them again in prolonged and complex financial negotiations with the diocesan board, county hail and the parochial church council. They found that they would be able to bear their share of the cost and the future burden of servicing a loan. This third and last addition to the old school building of 1887 was handed over in 1963. By then Bushwood school, along the lane, had taken in the infants and the church school no longer needed the Memorial Hall. But the staff situation remained critical; three part time teachers were employed. Even with the last extension there was overcrowding. When there were 205 pupils in five classes, and the hall was still used as a classroom, county hall was asked about the possibility of a mobile classroom. The number was expected to rise, and did so to 220 at the end of 1964. This time, however, the managers had had enough. There was to be no more extension. The increased population of Welham Green, the lack of additional space, the shortage of teachers, the fact that all previous extensions had been outstripped, the managers’ own limited funds, all made any further effort impossible. They felt that "they had done their stint". The diocesan authorities agreed; any further provision was now the responsibility of county hall alone. The county council’s best suggestion for the time being, not perhaps a welcome one was that the children living in Warrengate Road and Water End should be diverted from Welham Green to Brookmans Park primary school. "The last day the school will be open. In the New Year the infants will be transferred to the new school in Dellsome Lane and the juniors will attend either the Boys’ School or Little Heath school. The teaching and domestic staff have been offered and accepted posts in the new school but I, pupil and then pupil teacher in this school resign my position as headmistress." A few years earlier an inspector had written, "It is a worthwhile experience to spend a day in this lively country school." Thus ended the school’s 113 years of history. At the Welham Green church school overcrowding continued in spite of the diversion of children. The roll rose to 223 in 1965, putting great strain on the staff. The managers stood firm, no more extensions. They decided that the roll would be limited to 200 by reducing the intake from Bushwood Infants School and diverting the surplus away to the new county school in Brookmans Park. 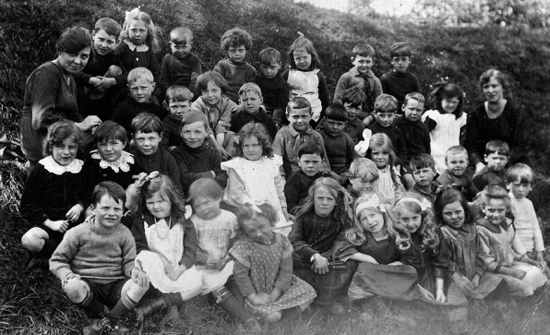 Ten infants did so depart from the fold, but a few years later the church school could take all the infants and such desertion was no longer required. The future lay with the amalgamation of this Church of England Mixed School, on the retirement of its headmaster, Jack Merritt, with the County Infants School at Bushwood as the North Mymms St Mary’s Church of England Junior and Mixed School. That was not to occur until 1980 when Mrs N Palmer became headmistress of the new combined school. The school managers and the staff at Welham Green had fulfilled their task. They had met the challenge of a changing local society as best they could. There was left the burden of loan repayment, but a shrewd move to switch the. original Casamajor investment from gilts to first class equities provided almost the sum required. The flagpole at the school had rotted away; perhaps it was the original one, thirty eight feet long, which had rejoiced the heart of Benjamin Mallett sixty years before, for it had been repaired, and by county hail, The managers agreed to spend the sum of £6 on a new one. The flag could still fly at the school in its ancient and modem buildings. The tradition of piety in education since 1710 had been maintained at Welham Green. "The appalling conditions in which children are being taught at the moment - a state of affairs which only a Dickens could adequately describe - not only in the County Council schools at Little Wymondly and the CE School at Stevenage, but also in an area like Brookmans Park where no maintained school is available and ‘front parlour’ Dame schools have to be resorted to by parents who as ratepayers and taxpayers have been clamouring for a County Council school for many years." Eventually the Minister did agree to include Brookmans Park Junior and Infants School in the 1950 building programme. In the meantime land had had to be found. The site originally purchased, seven and a quarter acres north of Georges Wood Road and adjoining The Drive and the golf course, was now too far away from the centre. The authority, therefore, bought the present site, "lying to the west of Bradmore Way and to the east of the proposed extension of Peplins Way", with an access strip between numbers 35 and 41 Bradmore Way. Part of this three and a half acres belonged to Dearmans, the builders, part to John White, one of the developers of Brookmans Park. This second part required a compulsory purchase order. Once started, construction, of the new prefabricated type, was rapid and the first intake took place in autumn 1951. The school took in 110 children, considerably fewer than the earlier estimate. The first headmaster, Arthur Wilfred Harris and his staff of four seemed to be on a good wicket, a brand new school with four modern classrooms, in a flourishing commuter village, but it soon became a sticky one. Overcrowding began in the second year when a class had to be held in the staff room. Classes in the entrance hall and assembly hall marked 1954, with a roll of 233. One new classroom in that year was no solution and two more were built in 1956. Overcrowding continued with the roll rising to 350 and classes being held in the corridors, and it was again met in 1962 with two more classrooms. One further classroom brought to an end the struggle which had started with a protest from a parish councillor in 1946. Elementary education had been re-named primary as the Hadow Report had proposed in the 1930s, and secondary education was now for all children, not only for a selected few. But there were to be three different kinds of secondary school and the lasting influence of Hadow produced them: grammer, technical and modern. These were supposed to reflect three different kinds of ability in children. Since there were enough of the first two schools in the district, the secondary school in the parish was to be a modem school. It would be for those children who did not gain entry to the grammar and technical schools. Selection remained, albeit different in intention. As early as January 1945 the managers of the parochial schools minuted that they had "no objection to a Secondary School at or near Bell Bar." It was to be nearly twenty years before Chancellors School would open. The site was the same as that which had been rejected as unsuitable for the primary school, only larger. The county council had to negotiate for the land with three owners. It had already purchased six acres, part of the site including the playing fields. The problem was the intention of the chief landowner, John White, to build on the remaining ten acres required, and the planning authority’s equally firm intention to prevent it. 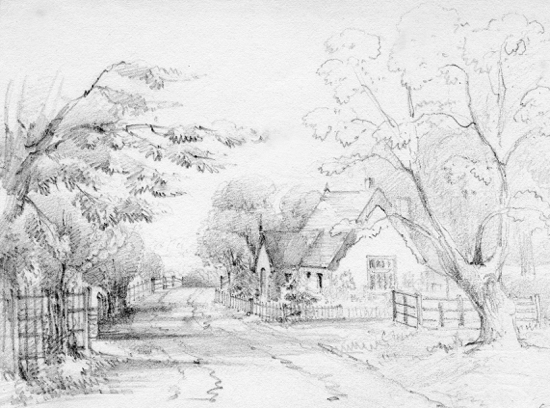 The proposed development included four roads; the start of three of them may still be seen. John White appealed to the Ministry of Housing and Local Government. He was turned down. More time elapsed as negotiations over price, compensation for loss of development rights, rights of way, access and roads, dragged on. The clerk to the county council intervened to express the hope that they would not delay building as "so many of our schools in this rapidly expanding county are bursting at the seams". The Ministry of Education had given approval to a school with 450 places. Eventually in May 1961 the county council agreed to the detailed schedules of accommodation of the 3-form entry secondary modem school at an estimated cost of £253,256. The school was included in the 1962-3 major building programme but the land in dispute was not finally acquired until December 1961 when the owner received his price from the county council, plus a much larger sum for loss of development rights from the Government. When the first headmaster, Frank Maynard, visited the site in March 1964 he saw only "sticky clay and gaunt structures of steel and concrete". But by that September the seemingly impossible had been achieved and the school was ready to receive seventy-two children. After prayers that morning they began work. The children’ came from the neighbouring villages of Essendon, Newgate Street, Northaw, as well as from Brookmans Park and the hamlets in the parish. The new secular secondary school was to create a community wider and more various than that which the old church had held together for centuries. In the future it would receive all sorts of children, without distinction of different kinds of ability. 1710 - North Mymms Charity School, Society for Promoting Christian Knowledge. 1811 -National Society for Promoting the Education of the Poor in the Principles of the Established Church. 1818 - A school for 42 girls & a Sunday school for 30 boys. 1824 - Brookmans National school for 50 girls. Teacher Mary May. 1831 - A school for 14 children of both sexes. 1835 - Welham Green National school for 50 boys. Teacher William George Goulburn. 1847 - Water End National school for girls & infants. Endowed by Caroline Casamajor. Teacher Magdalene White. 1854 - Water End school, teacher Annie Poole. 40 girls. 1861 - Welham Green school, teacher ,Ioha E Gray. 50 boys. 1862 - Water End school, teacher Caroline Read. 1863 - Revised Code of Regulations for Schools. 1866 - Welham Green school, teacher George Foster. Water End school, teacher Frederica Furness. 1870 - Education Act. Voluntary schools and Board school. Water End school, teacher Amelia Chapman. Water End school, teacher Annie Wiseman. 1880 - Education Act. Compulsory school attendance. 1880-88 - Welham Green school, teachers, Frederick Carter, Edward Knowles, William Lock. 58 boys. 1882 - Water End school, teacher Mrs Letitia Haines, 106 pupils. 1884 - Little Heath parochial school, teacher John Appleyard. 1887 - Welham Green school new building. 49 boys. 1889 - Welham Green school, teacher Benjamin Mallett. 46 boys. 1891 - School fees abolished. 1898 - Little Heath school, teacher Henry Cockerill. 1902 - Education Act. Rate aid for voluntary schools. 1905 - Little Heath school, public elementary school. 1906 - Water End School, teacher Mrs C Cooke. 51 girls, 40 infants. 1920 - Water End school, teacher Elsie Simon. c 100 pupils. 1922 - Welham Green-school teacher F W Merritt. 48 boys. 1926 - Welham Green school, teacher Alfred John Bradbeer. Hadow Report: Reorganisation of church schools. 1937 - Moffats preparatory school, Brookmans Park. 1941 - Ithaca House private school, Brookmans Park. 1944 - Education Act. "Aided" and "Controlled" schools. 1948 - Water End school, headmistress Mrs D Colville - 1960. 1949 - Welham Green school, headmaster Jack Merritt. 1951 - Brookmans Park County Primary School, headmaster A W Harris. 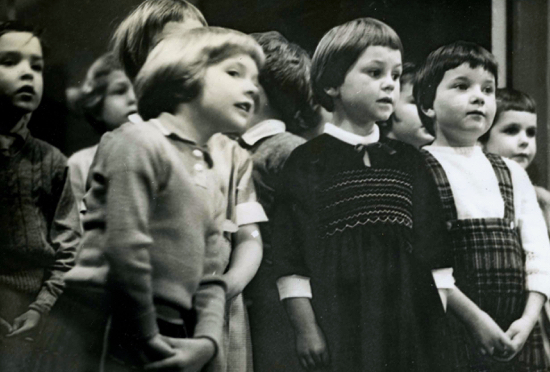 1961 - Bushwood County Infants school.